The P2X7 receptor is a trimeric ATP-gated cation channel found predominantly, but not exclusively, on immune cells. P2X7 activation results in a number of downstream events, including the release of proinflammatory mediators and cell death and proliferation. As such, P2X7 plays important roles in various inflammatory, immune, neurologic and musculoskeletal disorders. This review focuses on the use of P2X7 antagonists in rodent models of neurologic disease and injury, inflammation, and musculoskeletal and other disorders. The cloning and characterization of human, rat, mouse, guinea pig, dog, and Rhesus macaque P2X7, as well as recent observations regarding the gating and permeability of P2X7, are discussed. Furthermore, this review discusses polymorphic and splice variants of P2X7, as well as the generation and use of P2X7 knockout mice. Recent evidence for emerging signaling pathways downstream of P2X7 activation and the growing list of negative and positive modulators of P2X7 activation and expression are also described. In addition, the use of P2X7 antagonists in numerous rodent models of disease is extensively summarized. Finally, the use of P2X7 antagonists in clinical trials in humans and future directions exploring P2X7 as a therapeutic target are described. ATP and other nucleotides, as well as nucleosides, are important extracellular signaling molecules that operate through a complex purinergic signaling network (Burnstock, 1972, 2006). This network is composed of a number of membrane receptors and ectoenzymes, which includes the P2X7 receptor (Yegutkin, 2008). The P2X7 receptor is encoded by the P2RX7 gene and belongs to the P2X family of trimeric ligand-gated cation channels, of which there are seven distinct members (P2X1–7) (Coddou et al., 2011). Of the P2X family, the P2X7 monomeric subunit is the largest, with a length of 595 amino acids for the human, rat, mouse, dog, and Rhesus macaque receptors (Surprenant et al., 1996; Rassendren et al., 1997; Chessell et al., 1998; Roman et al., 2009; Bradley et al., 2011b). Each subunit is characterized by relatively short and long intracellular amino and carboxyl (C) termini, respectively, as well as two hydrophobic membrane-spanning segments (transmembrane domains) separated by a long glycosylated extracellular ATP-binding domain. The trimeric structures of the human and Rhesus macaque P2X7 receptors are supported by atomic computer modeling (Roger et al., 2010b; Bradley et al., 2011b; Jiang et al., 2013), based on the crystal structure of the related zebrafish P2X4 receptor (Gonzales et al., 2009; Kawate et al., 2009). To the best of our knowledge, similar modeling experiments have not been carried out for rodent or canine P2X7 receptors. However, the structures of rodent and canine P2X7 receptors are likely to be similar to that of primate P2X7, as these receptors share 77–85% sequence identity to human P2X7 (Table 1). Furthermore, the study of native rat P2X7 complexes supports the trimeric arrangement of rodent P2X7 (Nicke, 2008). More recently, the crystal structure of the zebrafish P2X4 receptor in complex with ATP has been reported (Hattori and Gouaux, 2012). This agonist-bound structure provides new insights into the mechanism of P2X receptor activation and may be useful for the development of new pharmacological agents. Activation of P2X7 by extracellular ATP allows for the passage of small cations, including Ca2+, Na+, and K+, across the plasma membrane (Surprenant et al., 1996; Rassendren et al., 1997; Chessell et al., 1998). However, prolonged ATP stimulation leads to the formation of a larger reversible pore, which allows for the uptake of organic ions (Steinberg and Silverstein, 1987; Surprenant et al., 1996; Rassendren et al., 1997; Chessell et al., 1998) (see section VI). Activation of P2X7 by ATP, or the alternate, rodent-specific ligand nicotinamide adenine dinucleotide (NAD), results in a number of cell-specific downstream signaling events, many of which were established or are supported by rodent models of disease (see sections VII and X). These downstream signaling events are dependent on a variety of factors, including cell type, extracellular conditions, and the concentration of extracellular ATP (Burnstock, 2007). The presence of ectonucleotidases, which degrade ATP and other nucleotides, regulate the concentration and duration of availability of P2 receptor agonists in the extracellular space (Yegutkin, 2008). Thus, P2X7 receptors are possibly only activated after injury, infection, or in tumor microenvironments when the concentration of ATP increases locally or when ectonucleotidases are downregulated (Lenertz et al., 2011). Alternatively, it is possible that currently unknown allosteric modulators might act on P2X7 in vivo to decrease its Km for ATP, thus allowing the activation of P2X7 at lower nucleotide concentrations. There is also emerging evidence that P2X7 activation stimulates ATP release, further complicating the study of the ATP/P2X7 signaling axis. P2X7-mediated ATP release has been observed from human embryonic kidney (HEK)-293 cells transfected with rat or human P2X7 (Pellegatti et al., 2005), from astrocytes during Ca2+ signal transmission (Suadicani et al., 2006), from osteoclasts undergoing fusion (Pellegatti et al., 2011) and in culture (Brandao-Burch et al., 2012), and from melanoma cells after γ-irradiation (Ohshima et al., 2010). P2X7 is widely distributed throughout the mammalian body (see Burnstock and Knight, 2004). This receptor was originally thought to be restricted to cells of the hematopoietic lineages; this includes macrophages, dendritic cells, monocytes, lymphocytes, and erythrocytes, as well as osteoclasts, mast cells, and eosinophils. However, it is now evident that P2X7 is present on cells from other lineages, including osteoblasts, fibroblasts, endothelial cells, and epithelial cells. Furthermore, P2X7 is present on cells in the central and peripheral nervous systems, including microglia, astrocytes, oligodendrocytes, and Schwann cells (Sperlágh et al., 2006). In addition, there are reports of the presence of P2X7 on some populations of neurons, including those from the spinal cord, cerebellum, hypothalamus, and substantia nigra (see Lenertz et al., 2011; Wiley et al., 2011). Although P2X7 has been identified on a number of cell types, less is known about the relative distribution of P2X7 between different cell types within whole tissues. Recently, transgenic P2X7 reporter mice expressing enhanced green fluorescent protein downstream of the P2RX7 promoter have been generated (Engel et al., 2012; Garcia-Huerta et al., 2012; Jimenez-Pacheco et al., 2013), which is an important step toward addressing the distribution of P2X7 in vivo. For example, these mice have been used to localize P2X7 expression in the central nervous system after prolonged seizures, with P2X7 identified to be upregulated on neurons, but not upregulated on microglia or astrocytes, in the hippocampus and neocortex (Engel et al., 2012; Jimenez-Pacheco et al., 2013). Although the P2X7 expression on microglia and astrocytes was weak in these studies, P2X7 expression in these cell types is well established from immunohistochemical studies (see Verkhratsky et al., 2012). In addition, transgenic P2X7 green fluorescent protein reporter mice have been used to localize P2X7 on cells from the cerebral cortex and pons of newborn mice (Engel et al., 2012; Garcia-Huerta et al., 2012). P2X7 expression was also demonstrated in peritoneal macrophages and the spleen, validating the reliability of these mice (Garcia-Huerta et al., 2012). P2X7 has been associated with a number of diseases (see Miller et al., 2011; Sluyter and Stokes, 2011; Volonté et al., 2012). In particular, a number of human P2X7 single nucleotide polymorphisms (SNPs) or haplotypes that decrease or increase receptor function have been associated with various infectious, musculoskeletal, psychiatric, inflammatory, and cardiovascular diseases (see section VIII). In addition to diseases associated with SNPs, studies of human tissue or mouse models suggest that P2X7 may play important roles in a number of inflammatory, immune, neurologic, or musculoskeletal disorders. Such disorders include multiple sclerosis (Yiangou et al., 2006), amyotrophic lateral sclerosis (Yiangou et al., 2006), Alzheimer’s disease (Ryu and McLarnon, 2008; Diaz-Hernandez et al., 2012), Huntington's disease (Díaz-Hernández et al., 2009), cancer (Ghiringhelli et al., 2009; Adinolfi et al., 2012), ischemia (Arbeloa et al., 2012; Chu et al., 2012), neuropathic and inflammatory pain (Chessell et al., 2005), rheumatoid arthritis (Portales-Cervantes et al., 2010; Bhattacharya et al., 2011), glomerulonephritis (Taylor et al., 2009b), pulmonary fibrosis (Riteau et al., 2010), and graft-versus-host disease (Wilhelm et al., 2010). Given the potential importance of P2X7 in health and disease, considerable effort has gone into characterizing the presence and function of mammalian P2X7 receptors, and into the generation of selective P2X7 antagonists and the investigation of the potential therapeutic efficacy of such compounds in rodent models of disease. This paper aims to review recent developments regarding mammalian P2X7 receptors, with an emphasis on the use of P2X7 antagonists in rodent models of disease. Rodent P2X7 was first cloned from rat brain (Surprenant et al., 1996), followed by the cloning of P2X7 from NTW8 murine microglia soon after (Chessell et al., 1998). Compared with other P2X receptors, P2X7 requires at least one log higher ATP concentrations for activation (Table 1). Within this concentration range, ATP induces channel and pore formation in cells transfected with recombinant rat or mouse P2X7 (Surprenant et al., 1996; Chessell et al., 1998). With recombinant rat P2X7, the agonist order of potency was 2′(3′)-O-4-benzoylbenzoyl)-ATP (BzATP) >> ATP > 2-methylthio-ATP (2MeSATP) > adenosine-5′-O-(3-thiotriphosphate) (ATPγS) >> ADP (Surprenant et al., 1996). However, a more recent studied failed to confirm 2MeSATP and ATPγS as agonists of rat P2X7 (Donnelly-Roberts et al., 2009). Moreover, this same study failed to establish these same two nucleotides as agonists of murine P2X7 (Donnelly-Roberts et al., 2009). Notably, there are reported differences in P2X7 agonist sensitivities between these two species, with rat P2X7 being 10-fold more sensitive to BzATP and ATP than mouse P2X7 (Young et al., 2007). In rodents, P2X7 can also be activated via a unique ATP-independent pathway involving the transfer of an ADP-ribose group from NAD to P2X7 (Adriouch et al., 2001; Seman et al., 2003). ADP-ribosylation, a post-translational modification of proteins, is an important regulatory mechanism. In prokaryotes, ADP-ribosylation of target proteins is responsible for the adverse effects of a number of bacterial toxins in host cells (Ludden, 1994; Aktories, 2011). In eukaryotes, ADP-ribosylation has been implicated in transcriptional regulation, cell division, intracellular energy metabolism, neuronal signaling, and inflammation (Abd Elmageed et al., 2012; Hassler and Ladurner, 2012). Similar to ATP-induced P2X7 activation, NAD-induced activation of P2X7 results in Ca2+ flux, pore formation, phosphatidylserine exposure, shedding of CD62L, cell shrinkage, DNA fragmentation, and apoptosis (Adriouch et al., 2001; Seman et al., 2003). These NAD-induced P2X7 responses are observed in T cells, but they are not observed in macrophages (Adriouch et al., 2001; Hong et al., 2009). However, although the majority of studies investigating NAD-induced activation of P2X7 have been performed with murine T cells, there is also evidence that this pathway occurs in murine astrocytes (Wang et al., 2012) and rat retinal microvessels (Liao and Puro, 2006). Although NAD induces similar downstream events to that seen after ATP-induced activation of P2X7, much lower NAD concentrations are required for receptor activation compared with ATP (EC50 for phosphatidylserine exposure 2 and 100 μM, respectively) (Seman et al., 2003). It is noteworthy that NAD and ATP, released through the lysis of erythrocytes, are able to activate P2X7, suggesting that sufficient concentrations of these ligands can be released to activate P2X7 within rodents (Scheuplein et al., 2009). The transfer of ADP-ribose from NAD to P2X7 is catalyzed by the cell-surface ectoenzyme ADP-ribosyltransferase (ART) 2 (Adriouch et al., 2001), the crystal structure of which has been determined for rat (Mueller-Dieckmann et al., 2002). Of note, this pathway of P2X7 activation does not occur in humans because of the absence of ART2 orthologs (Haag et al., 1994). In rodents, there are two isoforms of ART2, termed ART2.1 and ART2.2. These isoforms are thought to play a role in the reported differences in sensitivities to NAD-mediated P2X7 activation between mouse strains and cell types. First, NAD induces Ca2+ flux, but not apoptosis, in T cells derived from C57BL/6 mice, whereas both these NAD-mediated P2X7 responses are observed in T cells derived from BALB/c mice (Adriouch et al., 2001; Hong et al., 2009). C57BL/6 mice have deficient expression of ART2.1 due to a premature stop codon in the Art2a gene (Kanaitsuka et al., 1997), which may explain these observations (Adriouch et al., 2001; Hong et al., 2009). Alternatively, these differences may also be explained by a known loss-of-function SNP present in C57BL/6, but not BALB/c, P2X7 (see section VIII). Second, ART2.2 has been reported on T cells, but not macrophages, from a number of mouse strains (Okamoto et al., 1998; Koch-Nolte et al., 1999; Hong et al., 2007). Moreover, bone marrow-derived macrophages from BALB/c mice do not constitutively express any ecto-ART subtypes; however, ART2.1 is upregulated on these cells in response to proinflammatory mediators (Hong et al., 2007). Despite this, these macrophages remain unresponsive to NAD when primed (Hong et al., 2009). Rather, NAD appears to potentiate ATP-induced P2X7 activation in these cells (Hong et al., 2009). Together, these results indicate that ART2.2 is important for NAD-mediated P2X7 activation and that different P2X7 signaling mechanisms operate in lymphoid and myeloid leukocytes, at least in mice. Human P2X7 was first cloned from a human monocytic cDNA library (Rassendren et al., 1997) using information from the cloned rat P2X7 sequence. Several pharmacological differences exist between human and rodent P2X7, including varying EC50 values for agonists ATP and BzATP (10- to 25-fold higher for humans) and sensitivity to other compounds. The agonist profile for human P2X7 is BzATP >> ATP > 2MeSATP > ATPγS > > ADP (Gargett et al., 1997; Donnelly-Roberts et al., 2009). Differences are also apparent in the electrophysiological profile between human and rat P2X7, with faster deactivation observed with human P2X7 expressed in HEK-293 cells activated by either ATP or BzATP (Rassendren et al., 1997). The C terminus was responsible for this effect because a chimeric receptor with human ectodomain and rat C terminus displayed an increased deactivation time, similar to rat P2X7 (Rassendren et al., 1997). More recently, Roger and colleagues (2008, 2010a) identified differences in the intracellular regulation of human and rat P2X7 by calmodulin. Rat P2X7 displays a Ca2+-calmodulin dependent facilitation of the ATP-induced inward current via a C-terminal calmodulin binding site, whereas human P2X7 only displays a smaller Ca2+-independent facilitation (Roger et al., 2010a). The P2X7 receptor has also been cloned from the guinea pig, dog, and Rhesus macaque. Details of recombinant and native P2X7 from these mammalian species are limited, but nevertheless highlight the potential of these species for the future study of P2X7-related diseases and in the mandatory testing and evaluation of preclinical drugs targeting P2X7. Guinea pig P2X7 was first cloned from a guinea pig brain cDNA library (Fonfria et al., 2008). Unlike the other cloned mammalian P2X7 receptors, guinea pig P2X7 is 594 amino acids in length because of the absence of a glutamic acid at position 77 (Fonfria et al., 2008). The EC50 value for ATP for guinea pig was similar to that of human P2X7, but in contrast to human (and rat) P2X7, BzATP was a weak partial agonist of guinea pig P2X7 (Fonfria et al., 2008). Notably, BzATP-induced responses were observed only in sucrose medium (Fonfria et al., 2008). The capacity of other nucleotides and NAD to activate this rodent P2X7 has not been assessed. Moreover, the electrophysiological characteristics of recombinant guinea pig P2X7 are yet to be reported, although P2X7-mediated currents have been detected in guinea pig myenteric neurons (Valdez-Morales et al., 2011). Further studies of native P2X7 within this species are required before guinea pigs can serve as a model of P2X7-related disorders and preclinical drug testing. Canine P2X7 was first cloned from a dog heart cDNA library from a nondisclosed breed (Roman et al., 2009). EC50 values for both BzATP and ATP of canine P2X7 were similar to that of human P2X7; however, BzATP was only a partial agonist of canine P2X7 (Roman et al., 2009). In contrast, activation of P2X7 in canine erythrocytes identified that ATP, relative to BzATP, was a partial agonist of native canine P2X7 (Stevenson et al., 2009). This finding is similar to that of native human P2X7, in which ATP was also reported to be a partial agonist relative to BzATP (Gargett et al., 1997). The reasons for these differences between recombinant and native canine P2X7 remain unknown but may relate to the functional assays employed or the cell types studied. The electrophysiological profile varies between human and canine recombinant P2X7, with a slower onset and decline in inward currents for canine P2X7 than human P2X7 expressed in HEK-293 cells activated by either ATP or BzATP (Roman et al., 2009). The capacity of other nucleotides to activate recombinant canine P2X7 has not been assessed. However, study of native P2X7 in canine erythrocytes demonstrates that 2MeSATP and ATPγS, but not ADP or UTP, may also be (partial) agonists of canine P2X7 (Sluyter et al., 2007). NAD also failed to induce ethidium+ uptake into canine lymphocytes and monocytes (Stevenson et al., 2009), suggesting that NAD is not an agonist of canine P2X7. Some attempts have been made to determine the tissue distribution of P2X7 in dogs. Functional P2X7 has been reported in erythrocytes, T cells, B cells, and monocytes (Sluyter et al., 2007; Stevenson et al., 2009; Jalilian et al., 2012a), as well as in kidney epithelial cells (Jalilian et al., 2012b). Of note, P2X7 activation induces the release of interleukin (IL)-1β from canine monocytes (Jalilian et al., 2012a) and whole blood (Roman et al., 2009; Spildrejorde et al., 2014). Collectively, these studies support the potential use of dogs in future studies of P2X7. In this regard, laboratories of GlaxoSmithKline (GSK) and Pfizer have already used dogs to assess the pharmacokinetics and bioavailability of P2X7 antagonists, including 2-oxo-N-(phenylmethyl)-4-imidazolidinecarboxamide analogs (Abberley et al., 2010) and 2-(4-chloro-3-[3-(1-hydroxycycloheptyl)propanoyl]phenyl)-4-[(2R)-2-hydroxy-3-methoxy-propyl]-1,2,4-triazine-3,5-dione (CE-224,535) (Duplantier et al., 2011), respectively. The pharmacokinetics and bioavailability of these compounds in dogs were similar to that observed for monkeys (Abberley et al., 2010; Duplantier et al., 2011) and thus potentially similar to that of humans. Rhesus macaque P2X7 was the first recombinant P2X7 to be synthesized from a published sequence rather than being generated via traditional cloning techniques (Bradley et al., 2011b). Both BzATP and ATP induce robust currents in cells transfected with Rhesus macaque P2X7, with EC50 values similar to that of human P2X7 (Bradley et al., 2011b). The capacity of other nucleotides or NAD to activate Rhesus macaque P2X7 has not been assessed. In regard to the latter, it is likely that NAD will also not activate Rhesus macaque P2X7, because the ART2 ortholog appears to be absent in primates (Haag et al., 1994). P2X7 protein is present in the retinal neurons of the Rhesus macaque (Ishii et al., 2003), but functional evidence and the tissue distribution of native P2X7 within these animals are lacking. Collectively, this limits the potential utility of these nonhuman primates as a model of P2X7-related diseases and preclinical testing of drugs targeting this receptor at this time. The binding of agonist molecules to ligand-gated ion channels transduces a signal to the channel gate, the region of the protein involved in opening the channel pore and allowing ionic flux to occur. Similar to other P2X receptors, P2X7 receptors are trimeric in structure (Nicke, 2008; Jiang et al., 2013) and contain three intersubunit nucleotide binding sites with residues from two individual monomers both contributing to the binding site. Six helical transmembrane domains span the membrane, and it is thought that the second transmembrane domains (TM2) of each P2X7 monomer form a physical gate to the flow of ions (reviewed in Jiang et al., 2013). Structural data from P2X4 (Hattori and Gouaux, 2012) suggest a rotation of the transmembrane domains after agonist binding opening the channel pore. The external portion of TM2 has been implicated as a channel gating domain; residues Ile332 to Val343 in P2X2 correspond to residues Val335 to Leu346 in P2X7 (Li et al., 2008). Once the TM2 domains have moved, the channel pore is fully open and conducts current, the directionality of this being dictated by the membrane potential. After agonist binding and gating rearrangements, monophasic or biphasic currents can be measured by standard whole-cell electrophysiology (Yan et al., 2008, 2011; Khadra et al., 2013). Mono- and biphasic currents through P2X7 channels are distinguished by the agonist concentration and whether the channel is “naive” to agonist or not (Khadra et al., 2013). However, P2X7 gating is more complex than other ion channels because of the secondary permeability pathway (see section VI). Single channel recordings of P2X7 channels have also been used to investigate how this ion channel operates. Markwardt and colleagues measured a single channel conductance of 9–13 pS for P2X7 in Xenopus laevis oocytes (Riedel et al., 2007a) and have developed extensive kinetic models for the transitions between open and closed states. These kinetic models were recently extended to a 16-state Markov model, taking into account both low-high affinity agonist binding and sensitization/desensitization states (Khadra et al., 2013). P2X7 was originally identified as the P2Z receptor, capable of permeabilizing cells after ATP addition. This defining feature of P2X7 activation was thought to be unique to this receptor for many years. However it is now apparent that activation of other purinergic receptors (P2X2, P2X4, P2X5, and P2X2/5), and indeed other ligand-gated ion channels (N-methyl-d-aspartate receptor and the transient receptor potential cation channel subfamily A member 1 and subfamily V member 1) can also permeabilize cells (Virginio et al., 1999; Chaumont and Khakh, 2008; Chung et al., 2008; Thompson et al., 2008; Banke et al., 2010; Compan et al., 2012b). Despite these observations, it should be noted that P2X7 is the only P2X receptor where this process is consistently observed. The secondary pore pathway permits the entry of normally impermeant organic cations such as N-methyl-d-glucamine+, ethidium+, and YO-PRO-12+. Organic anions such as lucifer yellow and carboxyfluorescein can also enter cells, although whether this involves the same permeation pathway as for cations is unclear. In addition to ion channels, the marine toxin maitotoxin (Schilling et al., 1999) and a sustained elevation of intracellular Ca2+ using the ionophore ionomycin (Faria et al., 2009) can also induce the opening of a pore pathway permitting impermeant dye entry. The search to understand the mechanism by which P2X7 permits large cation/anion uptake is still ongoing, as is the debate regarding whether this is an intrinsic property of P2X7 or whether it requires at least one other protein. Several studies have shown that the unique and characteristic long C-terminal tail of P2X7 is crucial for pore formation. Truncation of P2X7 abolishes dye uptake without affecting ion channel currents (Surprenant et al., 1996; Rassendren et al., 1997; Smart et al., 2003). Single point mutations due to polymorphisms can also dramatically affect the dye uptake response (Gu et al., 2001; Adriouch et al., 2002; Wiley et al., 2003). In addition, there is reported to be some dependence on second messenger pathways, including a role for Ca2+ (Donnelly-Roberts et al., 2004; Faria et al., 2005). These studies and others (reviewed in Rokic and Stojilkovic, 2013) have attempted to dissect out ion channel and secondary pore pathways. A breakthrough in mechanistic understanding came with the identification of pannexin-1 as a secondary protein involved in dye uptake (Pelegrin and Surprenant, 2006). However, there is now growing evidence suggesting that pannexin-1 cannot be the major pore pathway used by P2X7. For example, no defect in ATP-mediated YO-PRO-12+ uptake was observed in macrophages from pannexin-1 knockout (KO) mice (Qu et al., 2011), siRNA knockdown of pannexin-1 in mouse macrophages failed to affect P2X7 responses (Alberto et al., 2013), and pharmacological blockade of pannexin-1 did not affect ATP-induced dye uptake in transfected HEK-293 cells or human monocytes (Bhaskaracharya et al., 2014). Electrophysiological recordings of P2X7 currents suggest that biphasic currents reflect pore dilation (Yan et al., 2008; Khadra et al., 2013), and therefore a large proportion of the inward current is via the secondary permeability pathway. However, biphasic currents have not been recorded under single channel recording conditions (Riedel et al., 2007b). Recently, Browne et al. (2013) provided evidence for direct permeation of large molecules through the P2X7 channel pore. By introducing cysteine mutations into TM2, which lines the conductance pathway of the P2X7 channel pore, the direct access of methanethiosulfonate reagents to these residues after ATP treatment was demonstrated. Inhibition of P2X7 ion channel currents using methanethiosulfonate reagents also blocked fluorescent dye uptake (Browne et al., 2013). Given the importance of the secondary permeability pathway in signaling events downstream of P2X7 activation (see section VII), it is necessary that a clear understanding of this secondary pathway is established. Moreover, we must also consider the physiologic relevance of this additional pore pathway allowing influx/efflux of large molecules. Is this a mechanism for cells to take up ATP or other molecules required for an increased metabolic demand to respond to tissue injury or inflammation? Is this a mechanism for ATP release to drive further purinergic signaling? Or does this pathway provide a way of secreting chemical transmitter molecules such as glutamate? Cervetto and colleagues (2013a) recently demonstrated that glutamate efflux from P2X7-transfected HEK-293 cells was dependent on the long C terminus of rat P2X7 and the Cys-rich domain of the proximal C terminus, implicating the secondary pore pathway in efflux events. A number of cell type-specific signaling pathways have been associated with P2X7 activation. These include the activation of the caspase-1–containing inflammasome NLRP3 and the subsequent processing and release of proinflammatory interleukin-1 (IL-1) cytokines, as well as the formation of reactive oxygen and nitrogen species and the formation of phagolysosomes and subsequent killing of intracellular pathogens (see Hewinson and Mackenzie, 2007; Miller et al., 2011; Di Virgilio, 2013). Here we will review recent developments in established signaling pathways and novel signaling pathways associated with P2X7. In addition to the secretion of leaderless cytokines IL-1β (IL-1F2) and IL-18 (IL-1F4), P2X7 activation has also been shown to induce release of IL-1α (IL-1F1) (Pelegrin et al., 2008), IL-1 receptor antagonist (IL-1F3) (Wilson et al., 2004, 2007; Glas et al., 2009) and IL-36α (IL-1F6) (Martin et al., 2009). This places P2X7 as a major physiologic regulator of secretion of the IL-1 family of cytokines. A recent comprehensive investigation into the mechanism underlying NLRP3 inflammasome activation and IL-1β secretion by diverse stimuli, including P2X7, suggests K+ efflux is a common signal activating the NLRP3 complex (Muñoz-Planillo et al., 2013). Extracellular osmolarity and cell volume regulation also plays a role in the activation of NLRP3 inflammasome (Compan et al., 2012a), highlighting that it is the cellular microenvironment that is crucial for switching on cytokine secretion. The generation of reactive oxygen species (ROS) after ATP activation of P2X7 is now well established in macrophages (Lenertz et al., 2009; Moore and MacKenzie, 2009), microglia (Apolloni et al., 2013; Bartlett et al., 2013), submandibular gland cells (Seil et al., 2008), and erythroid cells (Wang and Sluyter, 2013). Activation of NADPH oxidase 2 by P2X7 was a common feature found in all cell types studied, although there is evidence that ATP, possibly via P2X7 activation, can also enhance mitochondrial reactive oxygen species (Nakahira et al., 2011). One downstream consequence of increased ROS generation in myeloid cells is the activation of the NLRP3 inflammasome and IL-1β secretion (reviewed in Gross et al., 2011; Tschopp, 2011). However, in a more recent study, ROS were not found to play a role in NLRP3 activation in bone marrow-derived macrophages (Muñoz-Planillo et al., 2013). Rather, a reduction of the intracellular K+ concentration was required. Despite this, there is evidence that K+ channel activity can be positively modulated by ROS (Ichinari et al., 1996; Avshalumov and Rice, 2003; Sesti et al., 2010), and it may be that ROS are able to induce NLRP3 activation in some cell types via this signaling process. Activation of P2X7 receptors can also lead to a number of membrane-related changes including membrane blebbing, microparticle and exosome release, multinucleated cell formation, reversible phosphatidylserine exposure, and the activation of membrane metalloproteases resulting in the shedding of cell-surface molecules (see Qu and Dubyak, 2009; Wiley et al., 2011). Recent work has identified additional cell surface molecules shed from the cell surface or released after activation of P2X7. This includes the chemokine CXCL16 (Pupovac et al., 2013a), the adhesion molecule CD44 (Lin et al., 2012), soluble amyloid precursor protein (Delarasse et al., 2011), and the IL-6 receptor (Garbers et al., 2011), in addition to CD62L (L-selectin), CD23 (the low-affinity IgE receptor) (Gu et al., 1998), and CD27 (Moon et al., 2006). Two metalloproteinases, ADAM10 and ADAM17, are the main effector molecules associated with these P2X7-mediated shedding events (Garbers et al., 2011; Pupovac et al., 2013a). Many physiologically relevant substrates are cleaved by these proteases, and it will be interesting to determine if P2X7 can induce cleavage of all ADAM10/17 substrates or only a subset. P2X7 activation can also induce the release of various enzymes. Andrei and colleagues (2004) first identified that ATP could induce lysosome exocytosis from human monocytes and measured cathepsin D secretion as a readout. It is now clear that lysosome secretion of cathepsins is a P2X7-mediated pathway likely regulated by increased intracellular Ca2+ concentrations. Cathepsins B, D, L, and S are also secreted in this manner from monocytes and macrophages (Lopez-Castejon et al., 2010). P2X7 activation can also stimulate the release of metalloprotease-9 (Gu and Wiley, 2006); however, the specific release mechanism is yet to be ascertained. Therefore, P2X7 can regulate several families of proteases, namely caspases (Ferrari et al., 1999), as well as cathepsins and matrix metalloproteinases. Prostaglandin E2 (PGE2), thromboxane B2, and leukotriene B4 are prostanoids induced by P2X7 signaling in murine macrophages (Barberà-Cremades et al., 2012). Phospholipases mediate the hydrolysis of arachidonic acid from various phospholipids, and P2X7 is known to activate cytosolic phospholipase A2 (Andrei et al., 2004) and Ca2+-insensitive phospholipase A2 isoforms (El Ouaaliti et al., 2012), in addition to phospholipase D (el-Moatassim and Dubyak, 1992). Arachidonic acid is then a substrate for cyclooxygenase and prostaglandin E synthases in the biosynthesis of PGE2. PGE2 plays an important role in inflammation, fever, and pain, and therefore is likely to be an important downstream signaling pathway from P2X7 in vivo. Given the activation of P2X7 by ATP in areas of tissue damage, this may place P2X7 as a potential alternative anti-inflammatory target to cyclooxygenase (Barberà-Cremades et al., 2012). Early reports exist showing that P2X7 induces nonvesicular release of excitatory amino acids such as glutamate and aspartate from murine astrocytes (Duan et al., 2003; Fellin et al., 2006). This finding was recently extended with the demonstration that P2X7 activation could induce glutamate efflux from rat cortical nerve terminals (Marcoli et al., 2008) and from HEK-293 cells expressing recombinant rat P2X7 (Cervetto et al., 2013a). Such contributions to extrasynaptic and/or synaptic glutamate concentrations may alter neurotransmission and could contribute to changes in neuroplasticity and behavior. P2X7 can influence gene expression through activation of a variety of transcription factors. Several studies have identified nuclear factor-κB p65 as a transcription factor regulated by P2X7 in microglia (Ferrari et al., 1997) and osteoclasts (Korcok et al., 2004). In monocytes, P2X7 activation can also induce cAMP response element-binding protein activation (Gavala et al., 2008) and FosB/activating protein-1 (Gavala et al., 2010), and in T cells, P2X7 activation can induce the translocation of nuclear factor of activated T cells to the nucleus (Yip et al., 2009). Therefore P2X7 may regulate gene expression in response to extracellular ATP, perhaps to reprogram cellular metabolism in times of stress or to switch on genes required for the inflammatory response. P2X7 is historically known for its ability of ATP to induce cell death through apoptosis (Zanovello et al., 1990; Chow et al., 1997; Ferrari et al., 1999). A role in cell proliferation would seem to be at odds with this, but evidence suggests that in certain cell types, activation of P2X7 is more likely involved with proliferation than cell death. This may be due to expression of particular splice variants (see section VIII), and this aspect certainly warrants further investigation in T cells and microglia. In T cells, release of autocrine ATP during activation through the T-cell receptor activates P2X7 and enhances secretion of the T-cell growth factor IL-2, through stimulation of the nuclear factor of activated T-cells transcription factor (Yip et al., 2009). Baricordi and colleagues (1996) first suggested a role for P2X7 in mitogen-induced T-cell proliferation. This same group subsequently went on to show that transfection of cell lines with full-length P2X7 or a truncated splice variant of this receptor increased cell proliferation, especially in the absence of serum (Baricordi et al., 1999; Adinolfi et al., 2005, 2010). In microglia, blocking P2X7 pharmacologically or overexpressing a pore-mutant (G345Y) to abolish secondary permeability reduced the proliferative response (Bianco et al., 2006; Monif et al., 2009). It will be interesting to determine if the trophic effect in microglia is also due to transcriptional regulation of a growth factor. A novel cellular signaling process associated with P2X7 is the regulation of phagocytosis (Wiley and Gu, 2012), a process by which foreign particles or organisms are taken up into cells. Transfection of HEK-293 cells, which are not normally phagocytic cells, with DNA encoding P2X7 introduces the ability to take up 1-μm latex beads or fluorescently labeled bacteria (Gu et al., 2010). Gu and colleagues (2009, 2010, 2011, 2012) propose that P2X7 is acting as a scavenger receptor. Typically, scavenger receptors, such as CD36, recognize modified lipoproteins, such as low-density lipoproteins (Endemann et al., 1993), and although it is noted that P2X7 has a similar two transmembrane domain structure to CD36 (Gu et al., 2011, 2012), whether P2X7 can recognize such lipoproteins is not yet known. The ability of P2X7-expressing cells to take up particles does not appear to require classic activation of the ion channel by extracellular ATP. In fact, stimulation of the channel with ATP switches off this phagocytic pathway (Gu et al., 2010). This suggests that particle uptake does not require classic signaling through the ion channel or the secondary pore pathway, but may use a novel signaling pathway due to association of P2X7 with the cytoskeleton (Gu et al., 2009, 2010). This is an exciting development in P2X7 cell biology, and further investigations may reveal other ligands for this receptor. In summary, P2X7 regulates ionic flux, protease activation, membrane events, and various secretion events. This is a diverse series of signaling pathways commonly involved in inflammation. Because these signaling pathways are cell type specific, it is highly likely that each cell type expressing P2X7 has a different complement of downstream effectors. This information is critical as we try to understand the role of P2X7 in disease and the potential for this receptor as a therapeutic target. In the last 10 years, particular attention has been drawn to the importance and contributions of P2X7 variants to the diversity of P2X7 receptor–mediated responses in health and disease, bringing the purinergic field to a point where these variants can no longer be ignored. In particular, these studies have highlighted the need for the consideration of variants in current and future in vivo rodent studies and human clinical trials. The two main causes of P2X7 variants, P2X7 SNPs and splice isoforms, as well as their implications for rodent studies, will be discussed below. The human P2X7 receptor will be discussed first because the largest body of work has been done in this species. The human P2RX7 gene is highly polymorphic, with over 1500 SNPs reported in the National Center for Biotechnology Information (NCBI) SNP database (www.ncbi.nlm.nih.gov/sites/entrez, accessed December 27, 2013). However, the majority of these SNPs are intronic, with approximately 150 nonsynonymous (or missense) SNPs reported in both this database and the Ensembl Genome Browser (asia.ensembl.org/index.html, accessed December 27, 2013). Of these nonsynonymous SNPs, a small number have been investigated to date that lead to altered human P2X7 function. A loss-of-function effect has been reported for SNPs V76A, R117W, G150R, E186K, L191P, R276H, R307Q, T357S, E496A, and I568N (Gu et al., 2001, 2004; Wiley et al., 2003; Shemon et al., 2006; Roger et al., 2010b; Stokes et al., 2010). Because of the absence of frequency data it is not clear whether R117W, E186K, or L191P represent SNPs or mutations. Investigations into the underlying mechanisms behind the loss-of-function effect of individual SNPs have revealed differences depending on the site of the mutations. Residue 307, originally thought to contribute to ATP binding (Gu et al., 2004), may instead be involved in hydrogen bonding and salt bridge structures in the P2X7 ectodomain (Jiang et al., 2013). Residue 568 lies within a trafficking motif, and mutant 568N-P2X7 receptors do not efficiently traffic to the cell membrane (Wiley et al., 2003). It is currently unclear how V76A, R117W, G150R, L191P, R276H, and E496A mutations cause a loss-of-function effect. SNPs in regulatory and intronic regions have also been identified, including the upstream promoter region (−762; rs2393799) (Li et al., 2002), an intronic splicing site at the exon1/intron1 boundary (rs35933842) (Skarratt et al., 2005), and the 3′-untranslated region affecting a microRNA binding site (rs1653625) (Rahman et al., 2010). However, only rs35933842 has been associated with a loss-of-function effect. A gain-of-function effect has been reported for three SNPs: H155Y, H270R, and A348T (Cabrini et al., 2005; Stokes et al., 2010). The underlying mechanisms behind these gain-of-function effects have not been established. There is some evidence to suggest that the amino acid variation at 155 increases cell surface expression of P2X7 (Bradley et al., 2011a); however, this was not observed in the initial report of this SNP (Cabrini et al., 2005). One of the most interesting SNPs in human P2RX7 is Q460R in the C terminus. In isolation this mutation does little to the functional response, but our investigations revealed coinheritance with gain-of-function SNPs in a particular haplotype (Stokes et al., 2010), perhaps explaining the association of this SNP with various disorders, including bipolar disorder (Barden et al., 2006), depression (Lucae et al., 2006), and Sjogren’s syndrome (Lester et al., 2013). In the last 5 years many studies have investigated the association of SNPs in P2RX7 with a number of different diseases. Some studies have used individual key SNPs such as E496A or Q460R, whereas others have used a more informative 12 SNP approach. Loss-of-function haplotypes have been linked to susceptibility to extrapulmonary tuberculosis infection (Fernando et al., 2007), enhanced bone mineral density loss in postmenopausal women (Gartland et al., 2012; Jorgensen et al., 2012), and an increased risk of age-related macular degeneration due to reduced phagocytosis of cellular debris (Gu et al., 2013). Inheritance of E496A has been linked to a reduced risk of ischemic stroke and ischemic heart disease (Gidlof et al., 2012). The gain-of-function A348T SNP is protective for Toxoplasmosis gondii infection (Jamieson et al., 2010) and is found at an increased frequency in Arabic patients with rheumatoid arthritis (Al-Shukaili et al., 2011) and patients with major depressive disorder (Lucae et al., 2006). Q460R, which is in linkage disequilibrium with A348T, was found to be increased in patients with Sjogren's syndrome and was linked to increased seropositive disease (Lester et al., 2013). In summary, gain-of-function haplotypes of human P2X7 may protect against infection and premature bone loss, but may increase the risk of developing certain inflammatory and psychiatric disorders. On the converse, carrying loss-of-function haplotypes of P2X7 may protect against inflammatory disorders, such as heart disease, but may increase susceptibility to some infections. A number of SNPs have similarly been reported in the murine P2RX7 gene region, with a survey of the NCBI SNP database revealing >1700 SNPs (accessed December 27, 2013). The majority of these SNPs are intronic. With the Ensembl Genome Browser (accessed December 27, 2013), 34 SNPs were revealed to be present in the coding region of the full-length murine P2RX7 gene, 10 of which are nonsynonymous (Fig. 1). Nonsynonymous SNPs reported in the coding region of the murine P2RX7 gene. SNP, SNP ID, and alleles are as follows: S6N, rs227977285, and G/A; V32I, rs229167308, and G/A; E70Q, rs238213067, and G/C; G113D, rs37541158, and G/A; T117M, rs238065774, and C/T; R270Q, rs220799687, and G/A; P396R, rs37237164, and C/G; P451L, rs48804829, and C/T; R486H, rs37867325, and G/A; H514R, rs36331015, and A/G. Yellow and red circles refer to functionally characterized and noncharacterized SNPs, respectively. SNPs were identified using Ensembl Genome Browser (asia.ensembl.org/index.html, accessed December 27, 2013). Of the nonsynonymous SNPs reported for murine P2X7 in the NCBI SNP database and the Ensembl Genome Browser, only the P451L SNP has been characterized. This naturally occurring mutation leads to the replacement of the proline residue at position 451 by a leucine residue in the cytoplasmic tail of murine P2X7 (Adriouch et al., 2002). The distribution of the allelic versions of this SNP in different mouse strains is outlined in Fig. 2. The P451L SNP was originally identified based on studies of P2X7 function in T cells from different strains of mice, whereby T cells from BALB/c mice (451P) had significantly higher sensitivity to ATP than those from C57BL/6 mice (451L) (Adriouch et al., 2002). By transfecting HEK-293 cells with either of the two variants (451P or 451L), it was demonstrated that P2X7 channel and pore function were markedly reduced in cells expressing the mutated 451L allele. This was later confirmed in another study, in which HEK-293 cells expressing 451L had reduced cation dye uptake and Ca2+ flux compared with cells expressing 451P (Young et al., 2006). However, 451L was not found to be associated with reduced surface protein expression or maximum agonist-induced currents in this latter study. In contrast, human astrocytoma 1321N1 cells expressing 451L are reported to have fully functional P2X7, with a similar pharmacological profile to those expressing 451P (Donnelly-Roberts et al., 2009). Allelic versions of the loss-of-function P2X7 P451L SNP in different mouse strains (based on data from Adriouch et al., 2002; Sorge et al., 2012; Syberg et al., 2012). 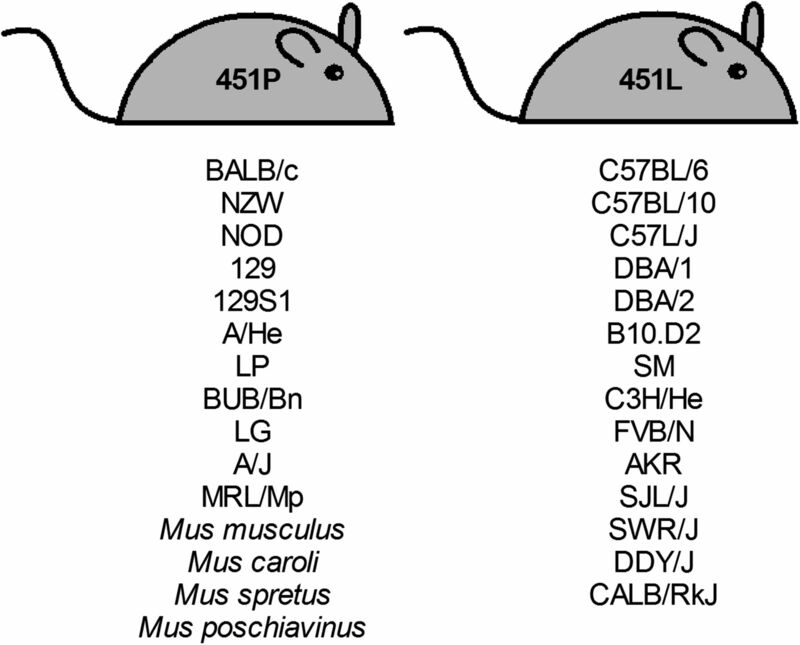 The 451P allele is also observed in rats and humans. Strains in italics are wild mouse strains. NZW, New Zealand White; NOD, nonobese diabetic. Differences in murine P2X7 function encoded by the 451P and 451L alleles are further supported by two additional studies with BALB/c and C57BL/6 mice, respectively. First, thymocytes from C57BL/6 mice display significantly impaired P2X7-induced cell death compared with those from BALB/c thymocytes (Le Stunff et al., 2004). In contrast, P2X7-induced phospholipase D stimulation was similar in thymocytes from both strains (Le Stunff et al., 2004). This suggests that P2X7-induced cell death and phospholipase D stimulation are controlled through distinct domains of P2X7. Second, astrocytes from C57BL/6 mice have attenuated ATP-induced pannexin-1 currents, ATP release, and intracellular Ca2+ waves compared with astrocytes from BALB/c mice, all of which were thought to be mediated by P2X7 (Suadicani et al., 2009). Of note, using a Src inhibitor and electrophysiological, biochemical, and fluorescence imaging techniques, this same study also provided evidence that P451L is located within the SH3 domain, a Src tyrosine kinase-binding site. This further supports the potential influence of this SNP on domain structure and function of the murine P2X7 receptor. The P451L SNP has been correlated with disease in two studies. First, genome-wide linkage analysis studies have found an association between the P451L SNP and neuropathic pain in mice (Sorge et al., 2012). In this study, mice from a number of different strains expressing the 451L allele showed less mechanical allodynia, a symptom of neuropathic pain, after spared nerve injury compared with those with the 451P allele. Second, an association between the P451L SNP and bone phenotype has been reported (Syberg et al., 2012). Strains with the 451L allele (C57BL/6 and DBA/2J) had weaker femurs, lower amounts of the bone resorption marker C-telopeptide collagen, and lower bone mineral densities compared with those strains with the 451P allele (BALB/cJ and 129X1/SvJ). However, the cellular bases for these differences were not established, whereas other measured bone parameters were not associated with the P451L SNP. In addition to the naturally occurring P451L SNP, nonsynonymous mutations have also been identified in murine cell lines. For example, L11F, T221A, and T283M mutations have been found in P2X7 cloned from the NTW8 microglial cell line (Chessell et al., 1998; Young et al., 2006). These mutations have been associated with reduced function in this cloned receptor compared with the function of recombinant P2X7 cloned from a C57BL/6 mouse (Adriouch et al., 2002). By introducing point mutations, the T283M SNP, but not L11F or T221A SNPs, was found to be responsible for this low P2X7 function, with expression of the 283M variant leading to both reduced channel and pore activity (Young et al., 2006). In comparison, the 283T allele is present in P2X7 sequences from other mouse strains, as well as the rat and human sequences. Thus, the T283M mutation may be specific to the NTW8 cell line or a result of cloning. Further survey of the NCBI SNP database and Ensembl Genome Browser (both accessed December 27, 2013) reveals few nonsynonymous SNPs in the coding region of the other cloned mammalian P2X7 receptors. Nonsynonymous SNPs in the rat or guinea pig P2RX7 gene have not been reported. Two nonsynonymous SNPs, L103F and P452S, have been reported in the canine P2RX7 gene. In the other cloned mammalian P2X7 receptors, a phenylalanine residue resides at amino acid position 103. Thus, it is likely that 103F may also represent the more common variant in dogs and that the SNP at this position may be more accurately defined as F103L rather than the reported L103F. Nevertheless the cloned canine P2X7, which contains a leucine residue at amino acid position 103, forms a functional receptor (Roman et al., 2009), although its relative effect compared with canine P2X7 containing residue 103F remains unknown. The P452S SNP in the canine P2RX7 gene is located at the equivalent position as the partial loss of function SNP, P451L, of the murine P2RX7 gene. The functional effect of this canine SNP remains unknown. Finally, one nonsynonymous SNP, I75M, has been reported in the Rhesus macaque P2RX7 gene. An isoleucine residue is found at this amino acid position in each of the other cloned mammalian P2X7 receptors, and the functional effect of a methionine at this position remains to be determined. Alternative splicing is a process that enables one gene to produce multiple protein isoforms, with a number of alternative P2X7 splice variants identified for the human and rodent receptor to date. In humans, seven naturally occurring splice variants were initially reported and termed P2X7B to P2X7H (Cheewatrakoolpong et al., 2005), with P2X7A referring to the original full-length 595 amino acid protein (Rassendren et al., 1997). These include truncated variants that have an alternate short C terminus (P2X7B, C, E, and G), variants that lack exons responsible for coding parts of the extracellular domain (P2X7C–F) and variants that have additional exons, thought to result in P2X7 protein lacking the first transmembrane domain (P2X7G and H) (see Sluyter and Stokes, 2011). An additional two naturally occurring splice variants have been identified in humans, termed P2X7I and P2X7J (Feng et al., 2006). P2X7I codes for a null allele and is a result of SNP rs35933842 (Skarratt et al., 2005), whereas P2X7J is another truncated variant (Feng et al., 2006). These ten variants of human P2X7 differ in distribution, functional characteristics, and predicted physiologic roles. Of these, P2X7B is the best studied and is able to form functional channels but not the large pores that are often associated with inflammation and cell death (Adinolfi et al., 2010). P2X7J is similarly unable to form pores and also displays reduced ligand-binding ability and channel function and oligomerizes with P2X7A to form nonfunctional P2X7 heterotrimers (Feng et al., 2006). Naturally occurring P2X7 splice variants have also been identified in rodents. The first reported, originally termed P2X7(K) (Nicke et al., 2009) or P2X7K by others (Masin et al., 2012), results from a novel exon 1 in the rodent P2RX7 gene. This leads to a receptor with an alternate amino-terminal and first transmembrane domain (Nicke et al., 2009). In contrast to the human P2X7 variants mentioned above, P2X7K is a fully functional variant, with an 8-fold higher sensitivity to P2X7 agonists, slower deactivation, and increased propensity to form P2X7 pores compared with P2X7A. Furthermore, it was recently reported that this variant is sensitive to activation by extracellular NAD, whereas P2X7A is not (Schwarz et al., 2012). This is the first report suggesting that NAD is unable to activate P2X7A, which complicates the interpretation of earlier NAD studies. In this study, T cells were found to preferentially express P2X7K, whereas macrophages preferentially express P2X7A. This may account for differences in P2X7 signaling between these cell types in rodents (Hong et al., 2009; Xu et al., 2012) and suggests that P2X7 variants may mediate the differential sensitivity of macrophages and lymphocytes to NAD. However, the relative contribution of different P2X7 splice variants on NAD-mediated P2X7 activation in other cell types, such as astrocytes, has not been investigated. To the best of our knowledge, a similar variant to P2X7K has not been described in humans. C-terminal truncated P2X7 variants have also been identified in mice (Masin et al., 2012). These variants, termed P2X7 13B and P2X7 13C, are encoded by genes with alternative exon 13s, resulting in truncated or alternate short C termini, respectively. P2X7 13B was detected in all tissues tested, with strongest expression in the brain, salivary glands, and spleen, whereas P2X7 13C was present in the brain, lungs, and salivary glands. When expressed in HEK-293 cells, both variants displayed low cell surface expression and channel function and no pore formation. This low cell surface expression of P2X7 13B was due to inefficient trafficking to the cell surface and, similar to the human variant P2X7J (Feng et al., 2006), appeared to inhibit the function of full-length P2X7 through hetero-oligomerization (Masin et al., 2012). However, equivalent variants of human P2X7B-J are yet to be reported in rodents. Furthermore, the influence of these variants on P2X7 in vivo or even native P2X7 on primary cells has not been widely examined, and this may be a confounder in preclinical studies in rodents, particularly if the sensitivity of these variants to P2X7 antagonists varies. There are currently two strains of P2X7 KO mice available: the GSK line generated by Chessell et al. (2005) (see also Sim et al., 2004) and the Pfizer line generated by Solle et al. (2001). The GSK KO strain was generated by inserting a lacZ transgene and neomycin cassette into exon 1, whereas the Pfizer KO was generated by inserting a neomycin cassette into exon 13, replacing part of the C terminus of the receptor. These models have been extensively used for demonstrating P2X7 involvement in inflammatory and neuropathic pain (GSK KO), cytokine production, inflammation, bone formation, and a number of disorders (Pfizer KO) (see Volonté et al., 2012). However recent evidence, coinciding with the discovery of P2X7 splice variants, indicates that these mice may not be true knockouts. First, molecular and biochemical analyses indicated that the widely expressed P2X7K splice variant discussed above escaped deletion in the GSK KO, with highest expression in the spleen (Nicke et al., 2009). This is likely because of the fact that exon 1 of the P2RX7 gene was targeted in the generation of this KO strain, whereas the P2X7K variant encodes a novel exon 1. Although P2X7 activity is absent in macrophages and dendritic cells from this KO strain, T cells displayed higher levels of P2X7 activity than that of control mice (Taylor et al., 2009a). Second, molecular and biochemical analyses indicated that P2X7 13B and 13C C-terminal truncated variants, as well as a C-terminal truncated hybrid variant containing a short sequence of the targeting vector used to disrupt exon 13 of the P2RX7 gene, escaped deletion in the Pfizer KO mouse (Masin et al., 2012). However, unlike T cells from the P2X7K-expressing GSK KO, those from the Pfizer KO have reduced receptor function (Taylor et al., 2009a). The tissue-specific expression of functional P2X7 in these KO strains may explain the controversial staining of P2X7 in brain tissue from KO animals, which is identical to that of wild-type (WT) littermates (Sim et al., 2004; Sánchez-Nogueiro et al., 2005). In these studies, P2X7 antibodies may be detecting splice variants, which have escaped deletion, rather than P2X7-like proteins with similar immunogenicity or other proteins through nonspecific staining. In addition, these variants may explain some of the phenotypic and functional differences observed between these two KO strains (Fig. 3). Although P2X7 variants have escaped deletion in both the GSK and Pfizer KOs, overall evidence indicates that the P2X7A variant has been knocked out in both strains. Despite this, caution needs to be undertaken when interpreting results of in vivo studies that use these KO mice. Phenotypic and functional differences between GlaxoSmithKline (GSK) and Pfizer knockout (KO) mice compared with wild-type (WT) counterparts. Differences in P2X7 isoforms expressed, bone phenotype (mineral density, volume, and thickness), P2X7-mediated responses in T cells (pore formation, nucleotide-induced CD62L shedding, phosphatidylserine exposure, and cell death), and experimental autoimmune encephalomyelitis (EAE) between P2X7 KO mice generated by GSK and Pfizer compared with WT. a(Solle et al., 2001; Sim et al., 2004; Nicke et al., 2009; Masin et al., 2012); b(Gartland et al., 2003; Ke et al., 2003); c(Labasi et al., 2002; Taylor et al., 2008, 2009a); d(Chen and Brosnan, 2006; Sharp et al., 2008). There are a number of P2X7 antagonists commercially available, all of which vary in terms of chemical structure, mode of antagonism, specificity, and species selectivity. The first generation of compounds available that was capable of antagonizing P2X7 were generally nonspecific, with many also capable of inhibiting other P2X and in some cases P2Y receptors or other molecules (see Gever et al., 2006). These early antagonists include Reactive Blue 2, which was first used in the 1970s (Kerr and Krantis, 1979); suramin and Brilliant Blue G (BBG), which were first used in the 1980s (Dunn and Blakeley, 1988; Soltoff et al., 1989); and pyridoxal phosphate-6-azophenyl-2-4-disulfonic acid (PPADS), periodate-oxidized ATP (oATP), and 1-[N,O-bis(5-isoquinolinesulfonyl)-N-methyl-l-tyrosyl]-4-phenylpiperazine (KN-62), which were first used in the 1990s (Lambrecht et al., 1992; Murgia et al., 1993; Gargett and Wiley, 1997). Following on from their identification as P2X7 antagonists, structural modifications of these compounds were carried out in an attempt to improve their properties and specificity (see Romagnoli et al., 2008; Jiang, 2012). For example, MRS 2540 is based upon the structure of KN-62, and exhibits enhanced potency at both human and rodent P2X7 (Lee et al., 2008a; Hu et al., 2010). Of the earlier compounds, BBG remains one of the most useful. This compound is generally considered a specific P2X7 antagonist, blocking rat P2X7 in the nanomolar compared with micromolar range or not at all for other rat P2X receptors (P2X1, P2X2, P2X3, P2X2/3, P2X4, and P2X1/5) (Jiang et al., 2000). More recent data indicate that BBG also blocks pannexin 1 (Qiu and Dahl, 2009), complicating its use as a P2X7 antagonist. oATP is also widely used to antagonize P2X7, but has also been shown to inhibit other P2X receptors (including P2X2 and P2X3) (Evans et al., 1995) and attenuate proinflammatory signaling through P2 receptor–independent mechanisms (Beigi et al., 2003). However, the ability of oATP to bind irreversibly to P2X7 via covalent modification of the receptor (Murgia et al., 1993) makes this antagonist an attractive blocker of P2X7 in vivo. Likewise, PPADS, which can also bind irreversibly to P2X receptors (Nicke et al., 1998), also remains an attractive blocker of P2X7 in vivo. In the last two decades, a second generation of more specific antagonists has been developed (see Friedle et al., 2010; Bhattacharya et al., 2011; Jiang, 2012). This has been aided by high-throughput screening of large chemical libraries and has largely occurred alongside reports indicating important roles for P2X7 in pain and inflammation (Romagnoli et al., 2008). These newer drug-like antagonists are particularly important for the purinergic field, because the first generation of antagonists was generally designed for in vitro, rather than therapeutic, use. Furthermore, many of the original antagonists are subject to degradation when used in vivo or are predicted to have poor pharmacokinetics (Friedle et al., 2010; Jiang, 2012), problems avoided by many of the second generation P2X7 antagonists. Second generation P2X7 antagonists that have been characterized include the tetrazole/triazole-based compounds 3-[[5-(2,3-dichlorophenyl)-1H-tetrazol-1-yl]methyl]pyridine (A438079) (Nelson et al., 2006) and 1-(2,3-dichlorophenyl)-N-[[2-(2-pyridinyloxy)phenyl]methyl]-1H-tetrazol-5-amine (A839977) (Honore et al., 2009), the adamantane amides N-[2-[[2-[(2-hydroxyethyl)amino]ethyl]amino]-5-quinolinyl]-2-tricyclo[3.3.1.13,7]dec-1-ylacetamide (AZ10606120) (Michel et al., 2007), and N-(adamantan-1-ylmethyl)-5-[(3R-amino-pyrrolidin-1-yl)methyl]-2-chloro-benzamide (AACBA; also known as GSK314181) (Broom et al., 2008), the cyanoguanidine derivative N-(1-([(cyanoimino)(5-quinolinylamino) methyl] amino)-2,2-dimethylpropyl)-2-(3,4-dimethoxyphenyl)acetamide (A740003) (Honore et al., 2006), the cyclic imide 3-[1-[[(3′-nitro[1,1′-biphenyl]-4-yl)oxy]methyl]-3-(4-pyridinyl)propyl]-2,4-thiazolidinedione (AZ11645373) (Stokes et al., 2006), and the nicotinamide derivative N-([4-(4-phenyl-piperazin-1-yl]tetrahydro-2H-pyran-4-yl)-methyl)-2-(phenyl-thio) nicotinamide (JNJ-47965567) (Letavic et al., 2013). The concentration responses of some of these specific antagonists (including A438079 and AZ11645373) have been determined at native murine P2X7 receptors (Bartlett et al., 2013; Pupovac et al., 2013b), which is useful for their in vivo application. However, despite the availability of these newer P2X7 antagonists, many in vivo studies still use first generation antagonists (see section X). Moreover, there are a number of additional potential antagonists identified that have yet to be fully characterized (Donnelly-Roberts and Jarvis, 2007). One factor confounding pharmacological studies of P2X7 is the differential activity of P2X7 antagonists at receptors from different species (Table 2). For example, KN-62 at nanomolar concentrations potently inhibits all cloned mammalian P2X7 receptors, except rat, when expressed in HEK-293 cells (Fonfria et al., 2008; Donnelly-Roberts et al., 2009; Roman et al., 2009; Bradley et al., 2011b). In comparison, the commonly used in vivo P2X7 antagonist BBG is at least a 3-fold more potent antagonist of rat, murine, canine, or guinea pig P2X7 than human P2X7 (Fonfria et al., 2008; Donnelly-Roberts et al., 2009; Roman et al., 2009). Although these and similar studies reveal important insights into the specificity and selectivity of P2X7 antagonists, many are limited to examining recombinant P2X7 expressed in mammalian cells. It is unknown if the functional characteristics of P2X7 in these studies deviate from that of native P2X7 and, if so, to what degree. In addition, in vitro pharmacological results, and in particular IC50 values, are highly dependent on a number of factors. These include the assay (e.g., whether studying channel opening or pore formation), assay buffer (e.g., presence of divalent cations and bovine serum albumin can be inhibitory), host cell or cell type, agonist concentration, assay temperature, and antagonist mechanism of action (e.g., competitive or noncompetitive, reversible or irreversible, orthosteric or allosteric) (Hibell et al., 2001; Donnelly-Roberts and Jarvis, 2007). Of the antagonists listed in Table 2, PPADS, BBG, Reactive Blue, KN-62, and AZ10606120 are noncompetitive inhibitors of P2X7 (Jiang et al., 2000; Hibell et al., 2001; Honore et al., 2006; Felix et al., 2012). In contrast, A438079, A740003, and AZ11645373 are competitive inhibitors of P2X7 (Alcaraz et al., 2003; Nelson et al., 2006; Yan et al., 2011), whereas the mechanism of action of JNJ-47965567 remains to be determined. Collectively, all of the above have implications for direct pharmacological comparisons between in vitro studies but, more importantly, for the use of these antagonists in vivo. In this regard, the in vivo cellular environment may result in drastically different outcomes of P2X7 antagonists to those outcomes observed in vitro. In addition, an efficacious antagonist in an in vivo rodent model may not translate to a human therapeutic because of the differential activity of P2X7 antagonists at receptors from different species. Furthermore, differences between individuals may highly impact upon the efficacy of these compounds. Thus a number of factors need to be considered when using P2X7 antagonists in vivo. In addition to the above experimental differences, variations in amino acid homology in the ectodomain or presumed antagonist binding site between species may be one explanation for the differential activity of P2X7 agonists and antagonists at receptors from different species (Young et al., 2007; Michel et al., 2008). For example, one ectodomain residue (N284D) accounts for the 10-fold difference in ATP sensitivity between rat and mouse P2X7 (Young et al., 2007), whereas two other ectodomain residues (F95L and R126G) are important for the different antagonist effects of KN-62 and PPADS, respectively, at the human and rat receptor (Michel et al., 2008). Furthermore, P2X7 variants, including SNPs and splice isoforms, are likely to play a role in the differential activity of these compounds both between and within species. For example, N-[(2,4-dichlorophenyl)methyl]-1-methyl-5-oxo-l-prolinamide (GSK1370319A) has an almost 7-fold higher IC50 value for ATP-induced IL-1β in human blood cultures from individuals with the A348T gain-of-function SNP than those from individuals with the E496A loss-of-function SNP (McHugh et al., 2012). Thus, given that human P2X7 is highly polymorphic (see section VIII), this has ramifications for the future use of P2X7 antagonists in treating human disorders. In particular, a need for prospective genotyping and tailor-made drug regimens is highlighted. Likewise, P2X7 variants also need to be considered when investigating the pharmacological blockade of P2X7 in rodents, with many studies to date overlooking the existence of such variants. In addition to the nonspecific and specific P2X7 antagonists listed above, a number of other compounds have been shown to block P2X7 activation, many with IC50 values in the micromolar range (Table 3). Naturally derived compounds such as the traditional Chinese herb emodin (Liu et al., 2010; Jelassi et al., 2013; Zhu et al., 2014), the plant-derived alkaloids berberine and sanguinine (Shemon et al., 2004), niphatoxin C, sytlissadine A and sytlissadine B from the marine sponge (Buchanan et al., 2007a,b), and the estrogen hormone 17β-estradiol (Cario-Toumaniantz et al., 1998) can each block P2X7. The effects of other naturally derived compounds on P2X7 such as chelerythrine and colchicine are discussed below. Moreover, a number of enzyme inhibitors can block P2X7. Inhibitors of the Ca2+/calmodulin-dependent protein kinase (KN-62) (Gargett and Wiley, 1997), protein kinase C [chelerythrine and Ro 31-8220 (2-[1-(3-(amidinothio) propyl)-1H-indol-3-yl]-3-(1-methylindol-3-yl) maleimide methanesulfonate)] (Shemon et al., 2004, 2007), mitogen-activated protein kinases [SB 203580 4-(4-fluorophenyl)-2-(4-methylsulfinylphenyl)-5-(4-pyridyl)-1H-imidazole] and SB 202190 [4-(4-fluorophenyl)-2-(4-hydroxyphenyl)-5-(4-pyridyl)-1H-imidazole]] (Michel et al., 2006), a vascular endothelial growth factor receptor tyrosine kinase (Compound P [N-[4-(1-methylethyl)phenyl]-4-[2-(3-pyridinyl)ethyl]-1-phthala-zinamine]) (Shemon et al., 2008), and phospholipase D (CAY10593 [N-[2-[4-(5-chloro-2,3-dihydro-2-oxo-1H-benzimidazol-1-yl)-1-piperidinyl]-1-methylethyl]-2-naphthalenecarboxamide], CAY10594 [N-[2-(4-oxo-1-phenyl-1, 3, 8-triazaspiro[4, 5]dec-8-yl)ethyl]-2-naphthalenecarboxamide], and halopemide) (Pupovac et al., 2013b) can each directly block P2X7. In this regard, studies investigating signaling pathways downstream of P2X7 activation through the use of enzyme inhibitors need to ensure that such compounds do not directly impair P2X7. A number of therapeutic drugs can also impair P2X7 activation. The antipsychotic drugs, prochlorperazine and trifluoperazine and to a lesser extent triflupromoazine can each impair human, but not rodent, P2X7 channel and pore activation (Hempel et al., 2013). Colchicine, a drug used to treat gout and familial Mediterranean fever, can inhibit P2X7 pore but not channel activation (Marques-da-Silva et al., 2011). More recently, probenecid, which is used occasionally in the treatment of gout, has been found to block both the human P2X7 channel and pore (Bhaskaracharya et al., 2014). Thus, again caution needs to be made when assigning inhibitory actions of these drugs in both in vitro and in vivo studies. Furthermore, the possibility remains that the therapeutic action or unwanted side effects of such drugs may be due, in part, to P2X7 blockade. In addition to chemical compounds, P2X7 can be blocked by various cations (Jiang, 2009). In particular, the divalent cations Ca2+ and Mg2+, at concentrations found in vivo, can inhibit P2X7 activation in vitro (Surprenant et al., 1996; Chessell et al., 1998). The ability of these divalent cations to impair P2X7 is attributed to the ability of these cations to chelate the free acid form of ATP (or ATP4−), the presumed form of ATP responsible for P2X7 activation (Cockcroft and Gomperts, 1979; Li et al., 2013). However, evidence suggests that these and other divalent cations can also impair P2X7 by allosteric modulation (Acuna-Castillo et al., 2007; Liu et al., 2008; Moore and Mackenzie, 2008; Yan et al., 2011). Finally, it should be noted that a number of compounds potentiate ATP-induced P2X7 activation. The human antimicrobial peptide LL-37 can potentiate both human and mouse P2X7 activation (Elssner et al., 2004). In contrast, the murine antimicrobial peptide CRAMP can enhance human but impair murine P2X7 activation (Seil et al., 2010). The antibiotic polymyxin B can potentiate human P2X7 activation (Ferrari et al., 2004), whereas the antiparasitic ivermectin can potentiate human but not murine P2X7 (Norenberg et al., 2012). A variety of lipids, including lysophostidylcholine and sphingogosylphopshorylcholine, can also enhance human and murine P2X7 (Michel and Fonfria, 2007). The anesthetics ketamine, propofol, and thiopental have all been shown to increase P2X7-mediated currents (Nakanishi et al., 2007). Finally, a drug screen of 1040 approved low molecular weight drug compounds recently identified that the antihistamine clemastine can potentiate human P2X7 activation (Norenberg et al., 2011). Collectively, the expanding list of compounds that can either block or potentiate P2X7 activation highlights the promiscuous nature of this receptor and its ability to bind a large number of structurally diverse compounds. Pharmacological blockade of P2X7 has proved, by and large, to be efficacious in a range of rodent models of disease and injury. These studies have been comprehensively summarized in Tables 4–8. In these studies, a number of P2X7 antagonists with varying specificities have been used, at a range of concentrations, with varying injection sites and regimens. However, the efficacy of these compounds as presented in this review is potentially skewed, because studies in which P2X7 antagonists have had no effect may not have been published. Furthermore, some studies may have initially investigated the efficacy of multiple antagonists but only reported the outcomes of those that appeared beneficial. Although the majority of rodent studies report positive effects, there have been conflicting outcomes between groups for some models of human disease (e.g., status epilepticus, brain tumors, ischemia, and spinal cord injury, Tables 4 and 5). In many of the early studies listed in Tables 4–8, the antagonists used were relatively nonspecific, being either general P2X or P2 antagonists (e.g., PPADS, suramin, and oATP). Thus, the outcomes of these studies cannot definitively be associated with P2X7 but with P2 receptors in general. Furthermore, it is likely that some studies that used nonspecific P2 antagonists have been overlooked because these reports did not specifically discuss P2X7 (or the former term P2Z). Of the first generation antagonists, oATP was the main compound used for inhibiting P2X7 in vivo, followed by BBG and PPADS. In the last 6 years, a number of more specific antagonists have been used in in vivo studies, supporting the work done in earlier studies. Of these, A438079 was most commonly used, with generally positive outcomes reported. However, despite the availability of these newer antagonists, many recent studies are still using first generation antagonists, in particular BBG and oATP. This is likely because of their relatively low cost, effectiveness in earlier studies, and, in the case of BBG, its ability to cross the blood-brain barrier (Peng et al., 2009). Further studies with additional antagonists will be important for supporting a role for P2X7 in disease. This will be particularly relevant before considering antagonizing P2X7 in human clinical trials. The following sections summarize and report the parameters and outcomes of pharmacological blockade of P2X7 in rodent models of disease and injury (Tables 4–8). The outcomes of in vivo studies using P2X7 KO mice in similar models of disease (which support antagonist studies) are also discussed. To the best of our knowledge, the first reported use of a P2X7 antagonist in a rodent model of neurologic disease was in 2007 (Matute et al., 2007). Since then, there have been a number of in vivo studies investigating the effects of pharmacological blockade of P2X7 in rodent models of neurologic disease (Table 4). These have largely emerged alongside evidence suggesting a role for P2X7 in central nervous system disorders (see Takenouchi et al., 2010). Overall, P2X7 antagonists reduced disease scores and symptoms in rodent models of multiple sclerosis (experimental autoimmune encephalomyelitis), status epilepticus, brain tumors (glioma), autism spectrum disorders, mania, depression, and a range of protein folding diseases (including Alzheimer’s, Huntington’s, Parkinson’s and prion disease, and amyotrophic lateral sclerosis). Studies using P2X7 KO mice have supported the outcomes of P2X7 antagonist studies in models of neurologic disease. First, in an Alzheimer's disease model, injection of amyloid β resulted in an accumulation of IL-1β in WT, but not P2X7 KO mice (Sanz et al., 2009). This correlates with the positive outcomes reported in two different Alzheimer's disease models that used P2X7 antagonists (Ryu and McLarnon, 2008; Diaz-Hernandez et al., 2012). Second, in models of depression, P2X7 KO mice displayed antidepressant-like profiles in comparison with WT controls (Basso et al., 2009; Boucher et al., 2011; Csölle et al., 2013). Two different P2X7 antagonists (BBG and AZ10606120) also induced an antidepressant phenotype in WT mice (Csölle et al., 2013). However, the antagonist JNJ-47965567 had no effect on models of depression, although this antagonist was efficacious and slightly effective, respectively, in models of mania and neuropathic pain (Bhattacharya et al., 2013). To the best of our knowledge, this is the only documented use of JNJ-47965567, and it is possible that the injection regimen used was not sufficient to see an efficacious response in this disease model. The role for P2X7 in neurologic disease in rodents, however, is complicated by other varying results with P2X7 antagonists or P2X7 KO mice. For example, in a single study of experimental autoimmune encephalomyelitis (Matute et al., 2007), two different P2X7 antagonists were efficacious. In support of this finding, the incidence of experimental autoimmune encephalomyelitis was reduced 4-fold in GSK P2X7 KO mice compared with WT mice (Sharp et al., 2008). However, Pfizer P2X7 KO mice developed more severe experimental autoimmune encephalomyelitis than WT mice (Chen and Brosnan, 2006). In another example, Pfizer P2X7 KO mice were more susceptible to seizures than WT littermates in a model of status epilepticus (Kim and Kang, 2011). This finding was supported by the use of three P2X7 antagonists (oATP, A438079, and A740003), each of which enhanced disease symptoms in status epilepticus (Kim and Kang, 2011; Kim et al., 2011). In contrast, opposite outcomes were reported using two antagonists (BBG and A438079) in this disorder (Engel et al., 2012; Jimenez-Pacheco et al., 2013). In addition to neurologic diseases, there have been a number of studies investigating the effects of pharmacological blockade of P2X7 in rodent models of neurologic injuries (Table 5) induced by both focal and global ischemia/reperfusion, excitotoxicity, subarachnoid hemorrhage, and mechanical trauma (e.g., corticectomy, stab wound, and weight drop models). In addition, there have been a number of pain models investigated, including nerve ligation- and chemical-induced models of neuropathic pain and acute pain induced by heat. Lastly, P2X7 blockade in a model of morphine tolerance has been investigated. P2X7 antagonists were largely efficacious in these models, reducing injury scores, symptoms, and pain. In these studies, pain is often characterized by an increased sensitivity to painful stimuli (hyperalgesia) or a pain reaction in response to normally innocuous stimuli (allodynia). Notable differences were observed for models of ischemic and excitotoxic brain injury and mechanical-induced spinal cord injury. In these studies, P2X7 antagonists were reported to either exacerbate or reduce symptoms, despite similar protocols. Furthermore, these conflicting outcomes were observed despite the use of multiple antagonists in some studies (including Le Feuvre et al., 2003; Wang et al., 2004; Chu et al., 2012; Marcillo et al., 2012). Thus, notwithstanding given differences between laboratories, the cause of these opposing observations remains unknown. The efficacy of P2X7 antagonists in models of ischemic brain injury and neuropathic pain are supported by similar studies using P2X7 KO mice. In one study, neurologic deficits, neuronal death, and the overproduction of Fas ligand (CD95L), Fas-associated protein with death domain and caspase-8 were reduced in P2X7 KO mice compared with WT littermates after microsphere embolism (Lu et al., 2012). Likewise, P2X7 antagonists were efficacious in models of ischemia in three independent studies (Melani et al., 2006; Arbeloa et al., 2012; Chu et al., 2012). These findings contrast with another study in which P2X7 KO mice had similar amounts of cell death induced by temporary cerebral ischemia compared with WT mice (Le Feuvre et al., 2003). In this same study, P2X7 antagonists (oATP, PPADS, and KN-62) similarly had no effect on ischemic cell death. However an IL-1 receptor antagonist reduced cell death, suggesting IL-1α and IL-1β can be secreted via a P2X7-independent mechanism during cerebral ischemia in mice. In models of neuropathic pain, P2X7 KO mice lacked hypersensitivity to thermal and mechanical stimuli compared with WT mice (Chessell et al., 2005; Fulgenzi et al., 2008; Hansen et al., 2011). These studies support those that used P2X7 antagonists, in which a range of antagonists attenuated neuropathic pain (Table 5). Most laboratories studying the effects of P2X7 antagonists on inflammation in vivo have done so by relatively simple rodent models involving the injection of compounds such as formalin, acetic acid, lipopolysaccharide (LPS), carrageenan, mustard oil, croton oil, or venom (Table 6). In these models, inflammation has largely been assessed at either a cellular level or by using measures of pain, fever, or edema, three of the classic hallmarks of inflammation. In the majority of studies, administration of P2X7 antagonists reduced inflammatory processes. Of particular note was the separate use of multiple antagonists in some studies. These studies reported an antagonist-dependent reduction in LPS- (Gourine et al., 2005; Clark et al., 2010; Csölle and Sperlágh, 2010), carrageenan- (Teixeira et al., 2010b), and mustard oil-induced inflammation (Itoh et al., 2011) and further support the benefits of targeting P2X7 in inflammation. In addition to the use of multiple antagonists, the use of P2X7 KO mice, which demonstrate attenuated compound-induced inflammatory responses compared with WT counterparts, also supports the benefits of targeting P2X7 in inflammation. The majority of P2X7 KO studies investigating the role of P2X7 on inflammation in vivo have done so by injecting LPS. In these studies, LPS induced mechanical hypersensitivity, fever, hyporeactivity in response to phenylephrine, increased p38 and nuclear factor-κB phosphorylation, increased cytokines [IL-1β, IL-10, and tumor necrosis factor-α (TNF-α)], and decreased mean arterial pressure and pressor responses to noradrenaline in WT mice, all of which were attenuated or absent in P2X7 KO mice (Mingam et al., 2008; Clark et al., 2010; Barberà-Cremades et al., 2012; Chiao et al., 2013; Kim et al., 2013). These findings contrast with the results of one study, which found that LPS induced similar levels of IL-1β and TNF-α in the serum of WT and P2X7 KO mice (He et al., 2013). In this study, these cytokines were attenuated in NLRP3 KO mice, suggesting that these cytokines can be secreted via a P2X7-independent mechanism during LPS-induced inflammation in mice or that compensatory mechanisms operate in P2X7 KO mice. The role of P2X7 in visceral pain has also been investigated in P2X7 KO mice. In one study, acetic acid-induced visceral pain, as measured by writhing behavior, was largely absent in P2X7 KO mice compared with WT littermates (Fulgenzi et al., 2008). This same study also observed greatly reduced acetic acid-induced visceral pain in WT mice after pretreatment with the P2X7 antagonist oATP. The efficacy of P2X7 antagonists has also been examined in rodent models of musculoskeletal disorders such as arthritis, bone cancer, and Duchenne muscular dystrophy (Table 7). The majority of these studies examined inflammatory arthritis, for which there are two main types of rodent models employed. In the first model, intraplantar injection of Complete Freund's adjuvant (CFA) is used to induce inflammatory pain and swelling of the paws. This model is also used to investigate compound-induced inflammation, but is included here because of its relevance to musculoskeletal disorders. In the second model, collagen-induced or anti-collagen antibody-induced arthritis results in an autoimmune response against collagen and subsequent joint damage. These are generally used as models of rheumatoid arthritis, resulting in pathology similar to that of the human disease (Williams, 2012). A range of P2X7 antagonists has resulted in improved experimental outcomes in models of inflammatory arthritis (Table 7). In addition, GSK P2X7 KO mice do not develop CFA-induced inflammatory hypersensitivity (Chessell et al., 2005), whereas Pfizer P2X7 KO mice have reduced incidence and severity of anticollagen antibody-induced arthritis compared with WT littermates (Labasi et al., 2002; Fulgenzi et al., 2008). As a result of these and other studies, the first approved drugs that target P2X7 have undergone clinical trials in rheumatoid arthritis patients (see section XI). Although the majority of in vivo P2X7 antagonist studies have focused on neurologic and musculoskeletal inflammation and inflammatory disorders, there are a number of studies that have looked at the effects of pharmacological blockade of P2X7 in disorders associated with other tissues (Table 8). P2X7 antagonists reduced symptoms in rodent models of disorders affecting the bladder (hemorrhagic cystitis), colon (carcinoma), eyes (retinitis pigmentosa, photoreceptor degeneration, retinal ganglion cell death, retinal pigmented epithelium degeneration, subretinal hemorrhage, and optic nerve injury), heart (transplantation, cardiac transplant rejection, and myocardial ischemia), kidney (glomerulonephritis, lupus nephritis, hypertension, and renal injury), liver (obesity and hepatotoxicity), lung (chemical and allergic inflammation or chronic obstructive pulmonary disease), pancreas (autoimmune diabetes, islet allograft rejection, and pancreatitis), and skin (dermatitis, graft-versus-host disease, and melanoma). Altogether these studies used a range of antagonists, demonstrating the widespread effects of P2X7 in a number of tissues and expanding the number of disorders that may benefit from P2X7 blockade. Furthermore, a number of these studies also had supporting P2X7 KO mouse data alongside P2X7 antagonist data, further implicating P2X7 in a number of disease processes. These include models of hemorrhagic cystitis (Martins et al., 2012), glomerulonephritis (Taylor et al., 2009b), hypertension and renal injury (Ji et al., 2012), lung inflammation (Lucattelli et al., 2011), allergic airway inflammation (Müller et al., 2011), pancreatitis (Hoque et al., 2011), and graft-versus-host disease (Wilhelm et al., 2010). Because of the potential benefits of P2X7 blockade in rodent studies, the use of drugs targeting P2X7 in humans has commenced for a number of disorders, including arthritis, pain, and multiple sclerosis (Baas, 2012). Of these trials, only two have been published as full-length reports, with both reporting the clinical efficacy and safety of the P2X7 antagonists AZD9056 or CE-224,535 in rheumatoid arthritis patients (Keystone et al., 2012; Stock et al., 2012). However, both of the trials failed to find any therapeutic benefit with these compounds (Keystone et al., 2012; Stock et al., 2012). The first of these trials were two phase II studies in patients with rheumatoid arthritis treated with the AstraZeneca compound, AZD9056 (Keystone et al., 2012). Despite a significant reduction in swollen and tender joint count in the phase IIa study, there was no significant benefit on disease in the phase IIb study. With the exception of one patient, who required hospitalization for nausea and vomiting after treatment with AZD9056, there were no significant side effects. The second clinical trial reported was a phase IIa study in patients with rheumatoid arthritis treated with the Pfizer compound, CE-224,535 (Stock et al., 2012). There was no significant benefit on disease with this compound. Furthermore, treatment with CE-224,535 resulted in a small but acceptable increase in the rate of nausea and diarrhea. In both clinical trials there were no serious infections or deaths related to adverse events (Keystone et al., 2012; Stock et al., 2012). As a result of these studies, both groups concluded that P2X7 does not appear to be a useful target in rheumatoid arthritis (Keystone et al., 2012; Stock et al., 2012). However, the possibility remains that the efficacy of these P2X7 antagonists is dependent on P2RX7 genotype, as indicated in other in vitro studies using GSK1370319A (McHugh et al., 2012). Thus, it may be essential to stratify clinical data by P2RX7 genotype to detect therapeutic benefits of P2X7 blockade. The possibility also remains that P2X7 blockade is of no therapeutic benefit in patients who are refractory to methotrexate or sulfasalazine, because both studies used a patient cohort already nonresponsive to these therapies. Thus, it may be of value to explore if the therapeutic benefit of P2X7 blockade is influenced by methotrexate or sulfasalazine resistance. In the meantime, the trial of AZD9056 or CE-224,535 in other human disorders and the trial of other compounds, such as those from GSK (Abberley et al., 2010) and Johnson & Johnson (Bhattacharya et al., 2013), await. P2X7 is widely distributed throughout the mammalian body (see section I); however, the relative expression and distribution of this receptor between cell types and tissues have not been fully elucidated. As also noted above (section I), future studies of P2X7 reporter mice expressing enhanced green fluorescent protein (Engel et al., 2012; Garcia-Huerta et al., 2012; Jimenez-Pacheco et al., 2013) will be useful for visualizing P2X7 expression patterns in both healthy and diseased animals. However, studies comparing the relative expression of P2X7 on cell types between mice and humans are lacking, and the possibility remains that this expression may not be comparable. In humans, P2X7 is present in decreasing amounts on monocytes, B cells and T cells (Gu et al., 2000), whereas in dogs P2X7 is present in greatest amounts on T cells and is present at lower amounts on monocytes and B cells (Stevenson et al., 2009). Nevertheless, modulation of P2X7 expression may provide an alternate therapeutic strategy in addition to pharmacological blockade. A range of inflammatory mediators can modulate P2X7 expression and its subsequent function on various cell types. Proinflammatory mediators such as interferon-γ (IFN-γ), TNF-α, and LPS can upregulate P2X7 on macrophages (Humphreys and Dubyak, 1998), umbilical vein endothelial cells (Wilson et al., 2007), and epithelial cells (Welter-Stahl et al., 2009). Conversely, anti-inflammatory mediators including transforming growth factor-β1, IL-4, and IL-10 can downregulate P2X7 on macrophages (Lemaire and Leduc, 2003; Gadeock et al., 2010). As a result of these and other studies, the possibility remains that such mediators may be used to regulate P2X7 expression and its subsequent function in a range of disorders. Other compounds may also be of value in modulating P2X7 expression. Recently, the dialdehydic compound 2-[1-(6-amminopurin-9-il)-2-osso-etossi]prop-2-enale (MED1011) was developed and shown to downregulate the expression and function of P2X7 in macrophages by causing the internalization of P2X7 in these cells (Muzzachi et al., 2013). Moreover, the medicinal extract from Aloe vera has been shown to downregulate P2X7 expression in macrophages to attenuate IL-1β secretion (Budai et al., 2013). Alternatively, P2X7 expression could potentially be down modulated by use of RNA interference. Small interfering RNA has been used to specifically downregulate P2X7 in mice and rats to attenuate diseases such as brain injury (Chen et al., 2013a) and nephritis (Zhao et al., 2013). Finally, P2X7 expression and its subsequent function could be downregulated by targeting the specificity protein 1 transcription factor (Sp1), which plays an important role in the transcriptional regulation of P2X7 (Garcia-Huerta et al., 2012). Of note, targeting Sp1 by small hairpin RNA or the antibiotic mithramycin, which blocks Sp1 activity, downregulates P2X7 in vitro (Garcia-Huerta et al., 2012). 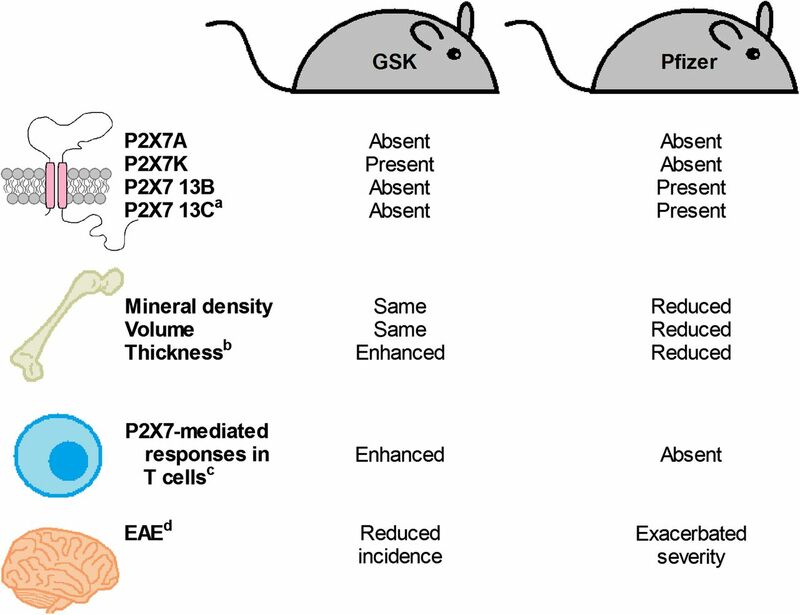 Rodent models are valuable tools for investigating the role of P2X7 in health and disease. However, there are a number of factors that need to be considered when interpreting the results of such studies in the context of human disease. First, unlike human P2X7, rodent P2X7 can be activated by the alternate ligand NAD to induce similar downstream signaling events to that of ATP activation. Second, P2X7 variants, such as the murine P451L SNP and spice isoforms P2X7K, P2X7 13B, and P2X7 13C, contribute to the diversity of receptor-mediated responses, thus adding further complexity to P2X7 studies in rodents. This is particularly highlighted by the currently available P2X7 KO mice, in which some of these variants have escaped deletion. Identification of P2X7 in the guinea pig, dog, and Rhesus macaque, in addition to the rat and mouse, highlights the potential of these species for the future study of P2X7-related diseases and in the mandatory testing and evaluation of preclinical drugs targeting P2X7. In general, a variety of P2X7 antagonists have been reported to be efficacious in rodent models of neurologic disease and injury, compound-induced inflammation, musculoskeletal disorders, and disorders associated with other tissues. In these studies, there was no clear consensus on the use of P2X7 antagonists in terms of doses or injection sites, with a variety of regimens successfully employed. Although nonspecific P2X7 antagonists were used in a number of these studies, the outcomes of some have been confirmed in more recent years through the use of more specific P2X7 antagonists. This suggests that P2X7 may play a role in a wide variety of diseases, implicating this receptor as a potential therapeutic target in a broad range of settings. However, differential activity of P2X7 antagonists is observed at receptors between individuals and species, presumably as a result of P2X7 variants and variations in amino acid homology in antagonist binding sites. Thus, this may be a limitation of translating preclinical studies of P2X7 antagonists in rodents to clinical trials in humans. Although rodent models and P2X7 antagonists have been valuable tools for investigating P2X7 in vivo, the following considerations may prove useful in future studies. First, the use of more selective P2X7 antagonists will support the current in vivo literature proposing a role for P2X7 in disease and injury. However, this may be limited for many laboratories because of the lack of availability or high cost of such antagonists. Second, although a number of commonly used antagonists are branded as P2X7 specific, there is still an absence of comprehensive information on the specificity of these compounds against other P2 receptor members, especially for mouse P2X7. In addition, data are lacking on the effects of many of these antagonists on recombinant murine variants. It will be important to obtain more complete pharmacological profiles for some of the widely used P2X7 antagonists, as previously done at a number of human and rat P2X subtypes (Bianchi et al., 1999; Donnelly-Roberts et al., 2009). Third, the generation of a complete P2X7 KO mouse, to negate the effect of escaped P2X7 variants, will be of value for future investigations. Fourth, the use of P2X7 antagonists in conjunction with various KO mice may be useful for determining the mechanisms of P2X7 action in vivo. For example, the use of the P2X7 antagonist A839977 in IL-1αβ KO mice, which lack genes for both IL-1α and IL-1β, has suggested that the positive effects of P2X7 inhibition in inflammatory pain models are mediated by blocking IL-1β release (Honore et al., 2009). Fifth, with the emergence of biologics (therapeutic antibodies) (Hatcher et al., 2011), anti-P2X7 antibodies represent promising tools for investigating the roles of P2X7 in disease and injury. In this regard, an anti-P2X7 monoclonal antibody was recently generated and demonstrated to inhibit mast cell activation and prevent the resulting intestinal inflammation in mice (Kurashima et al., 2012). Moreover, an anti-P2X7 monoclonal antibody has long been known to impair human P2X7 (Buell et al., 1998). Of note, this same antibody is capable of binding to rat and guinea pig P2X7 in transfected HEK-293 and human osteosarcoma U-2 OS cells (Smart et al., 2003; Fonfria et al., 2008), but whether this antibody is capable of blocking the activation of this receptor in these species remains unknown. Furthermore, single-domain antibodies, or nanobodies, have been shown to be promising tools for inhibiting specific membrane proteins (Pardon et al., 2014). In one pioneer study, an ART2.2-specific single-domain antibody was generated and shown to completely block ART2.2 enzymatic activity and NAD-induced cytotoxicity in vivo (Koch-Nolte et al., 2007). Thus, these antibodies could be used indirectly and reversibly to block P2X7 activation in mice. Likewise, this same technology is being applied to develop single-domain antibodies to P2X7 to directly target or inhibit this receptor (Laeremans et al., 2010). Finally, despite the development and patenting of a number of P2X7 antagonists for the treatment of human disease (Gunosewoyo and Kassiou, 2010), we are still awaiting results on the efficacy of many of these antagonists in humans, as well as the outcomes of current clinical trials, which will further influence future attempts to target P2X7. The authors thank J. J. Yerbury, M. L. Sanderson-Smith, and A. Pupovac (University of Wollongong) for critical review. Wrote or contributed to the writing of the manuscript: Bartlett, Stokes, Sluyter. This work was supported by an Australian Postgraduate Award from the University of Wollongong (to R.B. ); the University of Wollongong Global Challenges Program (to R.B. ); the National Health and Medical Research Council (to L.S. ), an RMIT University Vice Chancellor’s Research Fellowship (to L.S. ); the American Kennel Club Canine Health Foundation (to R.S. and L.S. ); the University Research Committee of the University of Wollongong (to R.S. ); and the Centre for Medical and Molecular Bioscience (to R.S.). (2010) Identification of 2-oxo-N-(phenylmethyl)-4-imidazolidinecarboxamide antagonists of the P2X(7) receptor. Bioorg Med Chem Lett 20:6370–6374. (2012) The poly(ADP-ribose) polymerases (PARPs): new roles in intracellular transport. Cell Signal 24:1–8. (2007) Differential role of extracellular histidines in copper, zinc, magnesium and proton modulation of the P2X7 purinergic receptor. J Neurochem 101:17–26. (2005) Basal activation of the P2X7 ATP receptor elevates mitochondrial calcium and potential, increases cellular ATP levels, and promotes serum-independent growth. Mol Biol Cell 16:3260–3272. (2010) Trophic activity of a naturally occurring truncated isoform of the P2X7 receptor. FASEB J 24:3393–3404. (2012) Expression of P2X7 receptor increases in vivo tumor growth. Cancer Res 72:2957–2969. (2002) Cutting edge: a natural P451L mutation in the cytoplasmic domain impairs the function of the mouse P2X7 receptor. J Immunol 169:4108–4112. (2001) Rapid induction of naive T cell apoptosis by ecto-nicotinamide adenine dinucleotide: requirement for mono(ADP-ribosyl)transferase 2 and a downstream effector. J Immunol 167:196–203. (2011) Bacterial protein toxins that modify host regulatory GTPases. Nat Rev Microbiol 9:487–498. (2011) P2X7 receptor gene polymorphism analysis in rheumatoid arthritis. Int J Immunogenet 38:389–396. (2013) Is pannexin the pore associated with the P2X7 receptor? Naunyn Schmiedebergs Arch Pharmacol 386:775–787. (2003) Novel P2X7 receptor antagonists. Bioorg Med Chem Lett 13:4043–4046. (2010) A comparative analysis of the activity of ligands acting at P2X and P2Y receptor subtypes in models of neuropathic, acute and inflammatory pain. Br J Pharmacol 159:1106–1117. (2004) Phospholipases C and A2 control lysosome-mediated IL-1β secretion: Implications for inflammatory processes. Proc Natl Acad Sci USA 101:9745–9750. (2013) The NADPH oxidase pathway is dysregulated by the P2X7 receptor in the SOD1-G93A microglia model of amyotrophic lateral sclerosis. J Immunol 190:5187–5195. (2012) P2X7 receptor blockade prevents ATP excitotoxicity in neurons and reduces brain damage after ischemia. Neurobiol Dis 45:954–961. (2011) Pharmacologic P2X purinergic receptor antagonism in the treatment of collagen-induced arthritis. Arthritis Rheum 63:3323–3332. (2003) Activation of ATP-sensitive K+ (K(ATP)) channels by H2O2 underlies glutamate-dependent inhibition of striatal dopamine release. Proc Natl Acad Sci USA 100:11729–11734. (2012) Paradoxical P2X7. SciBX 5:5–7. (2010) Dynamic changes in the TRPA1 selectivity filter lead to progressive but reversible pore dilation. Am J Physiol Cell Physiol 298:C1457–C1468. (2012) P2X7 receptor-stimulation causes fever via PGE2 and IL-1β release. FASEB J 26:2951–2962. (2006) Analysis of single nucleotide polymorphisms in genes in the chromosome 12Q24.31 region points to P2RX7 as a susceptibility gene to bipolar affective disorder. Am J Med Genet B Neuropsychiatr Genet 141B:374–382. (1996) An ATP-activated channel is involved in mitogenic stimulation of human T lymphocytes. Blood 87:682–690. (1999) Increased proliferation rate of lymphoid cells transfected with the P2X(7) ATP receptor. J Biol Chem 274:33206–33208. (2013) P2X7 receptor activation induces reactive oxygen species formation and cell death in murine EOC13 microglia. Mediators Inflamm 2013:271813. (2009) Behavioral profile of P2X7 receptor knockout mice in animal models of depression and anxiety: relevance for neuropsychiatric disorders. Behav Brain Res 198:83–90. (2003) Oxidized ATP (oATP) attenuates proinflammatory signaling via P2 receptor-independent mechanisms. Br J Pharmacol 140:507–519. (2014) Probenecid blocks human P2X7 receptor-induced dye uptake via a pannexin-1 independent mechanism. PLoS ONE 9:e93058. (2011) The physiology, pharmacology and future of P2X7 as an analgesic drug target: hype or promise? Curr Pharm Biotechnol 12:1698–1706. (2013) Pharmacological characterization of a novel centrally permeable P2X7 receptor antagonist: JNJ-47965567. Br J Pharmacol 170:624–640. (1999) Pharmacological characterization of recombinant human and rat P2X receptor subtypes. Eur J Pharmacol 376:127–138. (2006) A role for P2X7 in microglial proliferation. J Neurochem 99:745–758. (2011) Resilience and reduced c-Fos expression in P2X7 receptor knockout mice exposed to repeated forced swim test. Neuroscience 189:170–177. (2011a) Residues 155 and 348 contribute to the determination of P2X7 receptor function via distinct mechanisms revealed by single-nucleotide polymorphisms. J Biol Chem 286:8176–8187. (2011b) Pharmacological properties of the rhesus macaque monkey P2X7 receptor. Br J Pharmacol 164 (2b):743–754. (2012) The P2X7 receptor is an important regulator of extracellular ATP levels. Front Endocrinol (Lausanne) 3:41. (2008) Characterization of N-(adamantan-1-ylmethyl)-5-[(3R-amino-pyrrolidin-1-yl)methyl]-2-chloro-benzamide, a P2X7 antagonist in animal models of pain and inflammation. J Pharmacol Exp Ther 327:620–633. (2013) P2X7 receptor channels allow direct permeation of nanometer-sized dyes. J Neurosci 33:3557–3566. (2007a) Natural products, stylissadines A and B, specific antagonists of the P2X7 receptor, an important inflammatory target. J Org Chem 72:2309–2317. (2007b) Niphatoxin C, a cytotoxic tripyridine alkaloid from Callyspongia sp. J Nat Prod 70:2040–2041. (2013) Aloe vera downregulates LPS-induced inflammatory cytokine production and expression of NLRP3 inflammasome in human macrophages. Mol Immunol 56:471–479. (1972) Purinergic nerves. Pharmacol Rev 24:509–581. (2006) Pathophysiology and therapeutic potential of purinergic signaling. Pharmacol Rev 58:58–86. (2007) Purine and pyrimidine receptors. Cell Mol Life Sci 64:1471–1483. (2004) Cellular distribution and functions of P2 receptor subtypes in different systems. Int Rev Cytol 240:31–304. (2005) A His-155 to Tyr polymorphism confers gain-of-function to the human P2X7 receptor of human leukemic lymphocytes. J Immunol 175:82–89. (1998) Non-genomic inhibition of human P2X7 purinoceptor by 17β-oestradiol. J Physiol 508:659–666. (2012) Defective T-lymphocyte migration to muscles in dystrophin-deficient mice. Am J Pathol 181:593–604. (2013a) The P2X7 receptor as a route for non-exocytotic glutamate release: dependence on the carboxyl tail. J Neurochem 124:821–831. (2013b) Motor neuron dysfunction in a mouse model of ALS: gender-dependent effect of P2X7 antagonism. Toxicology 311:69–77. (2012) P2X7 receptor-NADPH oxidase axis mediates protein radical formation and Kupffer cell activation in carbon tetrachloride-mediated steatohepatitis in obese mice. Free Radic Biol Med 52:1666–1679. (2008) Patch-clamp coordinated spectroscopy shows P2X2 receptor permeability dynamics require cytosolic domain rearrangements but not Panx-1 channels. Proc Natl Acad Sci USA 105:12063–12068. (2005) Identification and characterization of splice variants of the human P2X7 ATP channel. Biochem Biophys Res Commun 332:17–27. (2006) Exacerbation of experimental autoimmune encephalomyelitis in P2X7R-/- mice: evidence for loss of apoptotic activity in lymphocytes. J Immunol 176:3115–3126. (2012) Role of P2X7 receptor-mediated IL-18/IL-18R signaling in morphine tolerance: multiple glial-neuronal dialogues in the rat spinal cord. J Pain 13:945–958. (2013a) P2X7 receptor antagonism inhibits p38 mitogen-activated protein kinase activation and ameliorates neuronal apoptosis after subarachnoid hemorrhage in rats. Crit Care Med 41:e466–e474. (2013b) P2X7R/cryopyrin inflammasome axis inhibition reduces neuroinflammation after SAH. Neurobiol Dis 58:296–307. (2005) Disruption of the P2X7 purinoceptor gene abolishes chronic inflammatory and neuropathic pain. Pain 114:386–396. (1998) Cloning and functional characterisation of the mouse P2X7 receptor. FEBS Lett 439:26–30. (2013) P2X7 receptor activation contributes to an initial upstream mechanism of lipopolysaccharide-induced vascular dysfunction. Clin Sci (Lond) 125:131–141. (1997) Purines and their roles in apoptosis. Neuropharmacology 36:1149–1156. (2012) Inhibition of P2X7 receptor ameliorates transient global cerebral ischemia/reperfusion injury via modulating inflammatory responses in the rat hippocampus. J Neuroinflammation 9:69. (2010) Involvement of microglial P2X7 receptors and downstream signaling pathways in long-term potentiation of spinal nociceptive responses. Brain Behav Immun 24:1176–1189. (2008) TRPV1 shows dynamic ionic selectivity during agonist stimulation. Nat Neurosci 11:555–564. (2010) P2X7-dependent release of interleukin-1β and nociception in the spinal cord following lipopolysaccharide. J Neurosci 30:573–582. (1979) Activation and inhibition of calcium-dependent histamine secretion by ATP ions applied to rat mast cells. J Physiol 296:229–243. (2011) Activation and regulation of purinergic P2X receptor channels. Pharmacol Rev 63:641–683. (2012a) Cell volume regulation modulates NLRP3 inflammasome activation. Immunity 37:487–500. (2012b) P2X2 and P2X5 subunits define a new heteromeric receptor with P2X7-like properties. J Neurosci 32:4284–4296. (2013) Neurochemical changes in the mouse hippocampus underlying the antidepressant effect of genetic deletion of P2X7 receptors. PLoS ONE 8:e66547. (2010) Peripheral origin of IL-1β production in the rodent hippocampus under in vivo systemic bacterial lipopolysaccharide (LPS) challenge and its regulation by P2X(7) receptors. J Neuroimmunol 219:38–46. (2013) P2X7 receptor is required for neutrophil accumulation in a mouse model of irritant contact dermatitis. Exp Dermatol 22:184–188. (2011) The purinergic receptor P2X7 triggers α-secretase-dependent processing of the amyloid precursor protein. J Biol Chem 286:2596–2606. (2002a) Relief of inflammatory pain in rats by local use of the selective P2X7 ATP receptor inhibitor, oxidized ATP. Arthritis Rheum 46:3378–3385. (2002b) Antinociceptive effect of a new P(2Z)/P2X7 antagonist, oxidized ATP, in arthritic rats. Neurosci Lett 327:87–90. (2013) The therapeutic potential of modifying inflammasomes and NOD-like receptors. Pharmacol Rev 65:872–905. (2012) In vivo P2X7 inhibition reduces amyloid plaques in Alzheimer’s disease through GSK3β and secretases. Neurobiol Aging 33:1816–1828. (2009) Altered P2X7-receptor level and function in mouse models of Huntington’s disease and therapeutic efficacy of antagonist administration. FASEB J 23:1893–1906. (2007) Discovery of P2X7 receptor-selective antagonists offers new insights into P2X7 receptor function and indicates a role in chronic pain states. Br J Pharmacol 151:571–579. (2004) Mitogen-activated protein kinase and caspase signaling pathways are required for P2X7 receptor (P2X7R)-induced pore formation in human THP-1 cells. J Pharmacol Exp Ther 308:1053–1061. (2009) Mammalian P2X7 receptor pharmacology: comparison of recombinant mouse, rat and human P2X7 receptors. Br J Pharmacol 157:1203–1214. (2003) P2X7 receptor-mediated release of excitatory amino acids from astrocytes. J Neurosci 23:1320–1328. (1988) Suramin: a reversible P2-purinoceptor antagonist in the mouse vas deferens. Br J Pharmacol 93:243–245. (2011) Optimization of the physicochemical and pharmacokinetic attributes in a 6-azauracil series of P2X7 receptor antagonists leading to the discovery of the clinical candidate CE-224,535. Bioorg Med Chem Lett 21:3708–3711. (1992) A novel pathway for the activation of phospholipase D by P2z purinergic receptors in BAC1.2F5 macrophages. J Biol Chem 267:23664–23673. (2012) Activation of calcium-insensitive phospholipase A2 (iPLA2) by P2X7 receptors in murine peritoneal macrophages. Prostaglandins Other Lipid Mediat 99:116–123. (2004) A novel P2X7 receptor activator, the human cathelicidin-derived peptide LL37, induces IL-1β processing and release. J Immunol 172:4987–4994. (2011) P2X7 receptor and caspase 1 activation are central to airway inflammation observed after exposure to tobacco smoke. PLoS ONE 6:e24097. (1993) CD36 is a receptor for oxidized low density lipoprotein. J Biol Chem 268:11811–11816. (2012) Seizure suppression and neuroprotection by targeting the purinergic P2X7 receptor during status epilepticus in mice. FASEB J 26:1616–1628. (1995) Pharmacological characterization of heterologously expressed ATP-gated cation channels (P2x purinoceptors). Mol Pharmacol 48:178–183. (2011) Expression of macrophage inflammatory protein-1α and monocyte chemoattractant protein-1 in glioma-infiltrating microglia: involvement of ATP and P2X7 receptor. J Neurosci Res 89:199–211. (2009) Pharmacological properties of a pore induced by raising intracellular Ca2+. Am J Physiol Cell Physiol 297:C28–C42. (2012) Development of a comprehensive set of P2 receptor pharmacological research compounds. Purinergic Signal 8 (Suppl 1):101–112. (2006) Purinergic receptors mediate two distinct glutamate release pathways in hippocampal astrocytes. J Biol Chem 281:4274–4284. (2006) A truncated P2X7 receptor variant (P2X7-j) endogenously expressed in cervical cancer cells antagonizes the full-length P2X7 receptor through hetero-oligomerization. J Biol Chem 281:17228–17237. (2007) A polymorphism in the P2X7 gene increases susceptibility to extrapulmonary tuberculosis. Am J Respir Crit Care Med 175:360–366. (1999) P2Z purinoreceptor ligation induces activation of caspases with distinct roles in apoptotic and necrotic alterations of cell death. FEBS Lett 447:71–75. (2004) The antibiotic polymyxin B modulates P2X7 receptor function. J Immunol 173:4652–4660. (1997) Extracellular ATP activates transcription factor NF-kappaB through the P2Z purinoreceptor by selectively targeting NF-kappaB p65. J Cell Biol 139:1635–1643. (2008) Cloning and pharmacological characterization of the guinea pig P2X7 receptor orthologue. Br J Pharmacol 153:544–556. (2003) Immunoreactivity for glial fibrillary acidic protein and P2 receptor expression on astrocytes in vivo. Drug Dev Res 59:175–189. (2007) Involvement of P2X and P2Y receptors in microglial activation in vivo. Purinergic Signal 3:435–445. (2010) Recent patents on novel P2X(7) receptor antagonists and their potential for reducing central nervous system inflammation. Recent Patents CNS Drug Discov 5:35–45. (2005) Inhibition of chemokine expression in rat inflamed paws by systemic use of the antihyperalgesic oxidized ATP. BMC Immunol 6:18. (2008) Periodate oxidized ATP (oATP) reduces hyperalgesia in mice: involvement of P2X7 receptors and implications for therapy. Int J Immunopathol Pharmacol 21:61–71. (2010) TGF-β1 prevents up-regulation of the P2X7 receptor by IFN-γ and LPS in leukemic THP-1 monocytes. Biochim Biophys Acta 1798:2058–2066. (2011) Species specificity of ADAM10 and ADAM17 proteins in interleukin-6 (IL-6) trans-signaling and novel role of ADAM10 in inducible IL-6 receptor shedding. J Biol Chem 286:14804–14811. (2012) The specificity protein factor Sp1 mediates transcriptional regulation of P2X7 receptors in the nervous system. J Biol Chem 287:44628–44644. (1997) ATP, a partial agonist for the P2Z receptor of human lymphocytes. Br J Pharmacol 122:911–917. (1997) The isoquinoline derivative KN-62 a potent antagonist of the P2Z-receptor of human lymphocytes. Br J Pharmacol 120:1483–1490. (2003) Multinucleated osteoclast formation in vivo and in vitro by P2X7 receptor-deficient mice. Crit Rev Eukaryot Gene Expr 13:243–253. (2012) Polymorphisms in the P2X7 receptor gene are associated with low lumbar spine bone mineral density and accelerated bone loss in post-menopausal women. Eur J Hum Genet 20:559–564. (2010) Activation of the transcription factor FosB/activating protein-1 (AP-1) is a prominent downstream signal of the extracellular nucleotide receptor P2RX7 in monocytic and osteoblastic cells. J Biol Chem 285:34288–34298. (2008) The nucleotide receptor P2RX7 mediates ATP-induced CREB activation in human and murine monocytic cells. J Leukoc Biol 84:1159–1171. (2006) Pharmacology of P2X channels. Pflugers Arch 452:513–537. (2009) Activation of the NLRP3 inflammasome in dendritic cells induces IL-1β-dependent adaptive immunity against tumors. Nat Med 15:1170–1178. (2012) A common missense variant in the ATP receptor P2X7 is associated with reduced risk of cardiovascular events. PLoS ONE 7:e37491. (2009) Purinergic P2X7 receptors regulate secretion of interleukin-1 receptor antagonist and beta cell function and survival. Diabetologia 52:1579–1588. 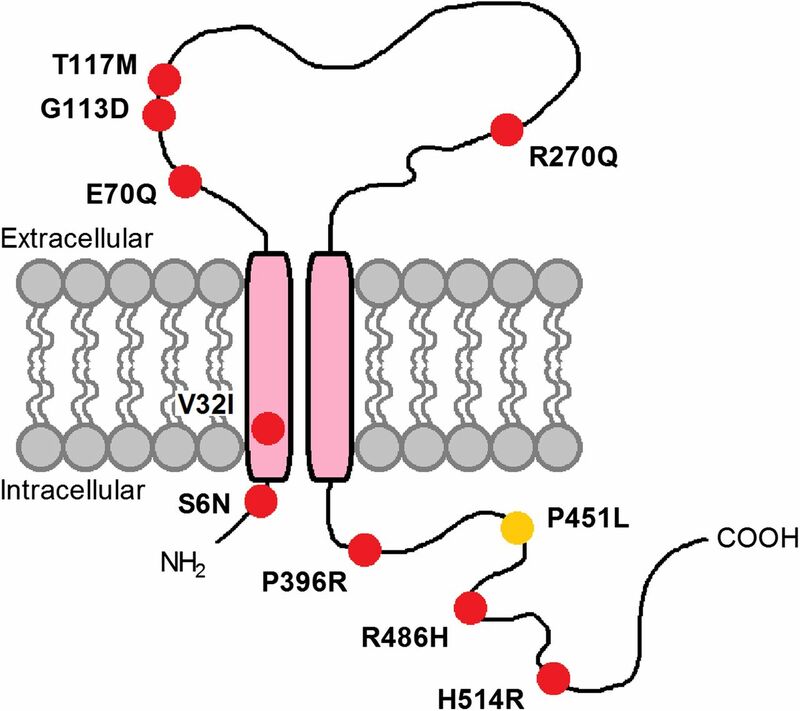 (2009) Pore architecture and ion sites in acid-sensing ion channels and P2X receptors. Nature 460:599–604. (2005) P2 receptor blockade attenuates fever and cytokine responses induced by lipopolysaccharide in rats. Br J Pharmacol 146:139–145. (2011) The inflammasome: an integrated view. Immunol Rev 243:136–151. (1998) Adenosine triphosphate-induced shedding of CD23 and L-selectin (CD62L) from lymphocytes is mediated by the same receptor but different metalloproteases. Blood 92:946–951. (2013) A rare functional haplotype of the P2RX4 and P2RX7 genes leads to loss of innate phagocytosis and confers increased risk of age-related macular degeneration. FASEB J 27:1479–1487. (2012) P2X7 receptor-mediated scavenger activity of mononuclear phagocytes toward non-opsonized particles and apoptotic cells is inhibited by serum glycoproteins but remains active in cerebrospinal fluid. J Biol Chem 287:17318–17330. (2009) Extracellular ATP dissociates nonmuscle myosin from P2X(7) complex: this dissociation regulates P2X(7) pore formation. Am J Physiol Cell Physiol 297:C430–C439. (2010) The P2X7-nonmuscle myosin membrane complex regulates phagocytosis of nonopsonized particles and bacteria by a pathway attenuated by extracellular ATP. Blood 115:1621–1631. (2011) P2X(7) is a scavenger receptor for apoptotic cells in the absence of its ligand, extracellular ATP. J Immunol 187:2365–2375. (2004) An Arg307 to Gln polymorphism within the ATP-binding site causes loss of function of the human P2X7 receptor. J Biol Chem 279:31287–31295. (2006) Rapid ATP-induced release of matrix metalloproteinase 9 is mediated by the P2X7 receptor. Blood 107:4946–4953. (2001) A Glu-496 to Ala polymorphism leads to loss of function of the human P2X7 receptor. J Biol Chem 276:11135–11142. (2000) Expression of P2X(7) purinoceptors on human lymphocytes and monocytes: evidence for nonfunctional P2X(7) receptors. Am J Physiol Cell Physiol 279:C1189–C1197. (2010) P2X purinergic receptor ligands: recently patented compounds. Expert Opin Ther Pat 20:625–646. (1994) Premature stop codons inactivate the RT6 genes of the human and chimpanzee species. J Mol Biol 243:537–546. (2011) P2X7 receptor-deficient mice are susceptible to bone cancer pain. Pain 152:1766–1776. (2012) Towards a structural understanding of PARP1 activation and related signalling ADP-ribosyl-transferases. Curr Opin Struct Biol 22:721–729. (2011) Biologics: the next-generation therapeutics for analgesia? Expert Rev Neurother 11:1653–1658. (2012) Feasibility study of B16 melanoma therapy using oxidized ATP to target purinergic receptor P2X7. Eur J Pharmacol 695:20–26. (2012) Molecular mechanism of ATP binding and ion channel activation in P2X receptors. Nature 485:207–212. (2012) Spinal P2X(7) receptor mediates microglia activation-induced neuropathic pain in the sciatic nerve injury rat model. Behav Brain Res 226:163–170. (2013) TLR agonists stimulate Nlrp3-dependent IL-1β production independently of the purinergic P2X7 receptor in dendritic cells and in vivo. J Immunol 190:334–339. (2013) The phenothiazine-class antipsychotic drugs prochlorperazine and trifluoperazine are potent allosteric modulators of the human P2X7 receptor. Neuropharmacology 75:365–379. (2007) P2X(7) receptor-mediated reactive oxygen and nitrogen species formation: from receptor to generators. Biochem Soc Trans 35:1168–1170. (2001) Complexities of measuring antagonist potency at P2X(7) receptor orthologs. J Pharmacol Exp Ther 296:947–957. (2007) Lipopolysaccharide, IFN-γ, and IFN-β induce expression of the thiol-sensitive ART2.1 Ecto-ADP-ribosyltransferase in murine macrophages. J Immunol 179:6215–6227. (2009) Differential regulation of P2X7 receptor activation by extracellular nicotinamide adenine dinucleotide and ecto-ADP-ribosyltransferases in murine macrophages and T cells. J Immunol 183:578–592. (2009) The antihyperalgesic activity of a selective P2X7 receptor antagonist, A-839977, is lost in IL-1alphabeta knockout mice. Behav Brain Res 204:77–81. (2006) A-740003 [N-(1-[(cyanoimino)(5-quinolinylamino) methyl]amino-2,2-dimethylpropyl)-2-(3,4-dimethoxyphenyl)acetamide], a novel and selective P2X7 receptor antagonist, dose-dependently reduces neuropathic pain in the rat. J Pharmacol Exp Ther 319:1376–1385. (2011) TLR9 and the NLRP3 inflammasome link acinar cell death with inflammation in acute pancreatitis. Gastroenterology 141:358–369. (2012) P2X7 receptor-mediated purinergic signaling promotes liver injury in acetaminophen hepatotoxicity in mice. Am J Physiol Gastrointest Liver Physiol 302:G1171–G1179. (2010) Stimulation of the P2X7 receptor kills rat retinal ganglion cells in vivo. Exp Eye Res 91:425–432. (1998) Modulation of P2X7 nucleotide receptor expression by pro- and anti-inflammatory stimuli in THP-1 monocytes. J Leukoc Biol 64:265–273. (1996) Direct activation of the ATP-sensitive potassium channel by oxygen free radicals in guinea-pig ventricular cells: its potentiation by MgADP. J Mol Cell Cardiol 28:1867–1877. (2003) Neuron-specific distribution of P2X7 purinergic receptors in the monkey retina. J Comp Neurol 459:267–277. (2013) P2X7 receptor in the trigeminal sensory nuclear complex contributes to tactile allodynia/hyperalgesia following trigeminal nerve injury. Eur J Pain 17:185–199. (2011) Central sensitization of nociceptive neurons in rat medullary dorsal horn involves purinergic P2X7 receptors. Neuroscience 192:721–731. (2012) Anti-prion activity of brilliant blue G. PLoS ONE 7:e37896. (2012a) Activation of the damage-associated molecular pattern receptor P2X7 induces interleukin-1β release from canine monocytes. Vet Immunol Immunopathol 149:86–91. (2012b) Functional expression of the damage-associated molecular pattern receptor P2X7 on canine kidney epithelial cells. Vet Immunol Immunopathol 150:228–233. (2010) Evidence for associations between the purinergic receptor P2X(7) (P2RX7) and toxoplasmosis. Genes Immun 11:374–383. (2013) Anthraquinone emodin inhibits human cancer cell invasiveness by antagonizing P2X7 receptors. Carcinogenesis 34:1487–1496. (2012) P2X(7) receptor antagonism attenuates the hypertension and renal injury in Dahl salt-sensitive rats. Hypertens Res 35:173–179. (2012) P2X receptor-mediated ATP purinergic signaling in health and disease. Cell Health Cytoskelet 4:83–101. (2009) Inhibition of P2X(7) receptors by divalent cations: old action and new insight. Eur Biophys J 38:339–346. (2013) Insights into the molecular mechanisms underlying mammalian P2X7 receptor functions and contributions in diseases, revealed by structural modeling and single nucleotide polymorphisms. Front Pharmacol 4:55. (2000) Brilliant blue G selectively blocks ATP-gated rat P2X(7) receptors. Mol Pharmacol 58:82–88. (2013) Increased neocortical expression of the P2X7 receptor after status epilepticus and anticonvulsant effect of P2X7 receptor antagonist A-438079. Epilepsia 54:1551–1561. (2012) Single-nucleotide polymorphisms in the P2X7 receptor gene are associated with post-menopausal bone loss and vertebral fractures. Eur J Hum Genet 20:675–681. (2013) Involvement of P2X(7) receptors in retinal ganglion cell death after optic nerve crush injury in rats. Neurosci Lett 534:237–241. (2005) Involvement of P2X receptor subtypes in ATP-induced enhancement of the cough reflex sensitivity. Eur J Pharmacol 528:158–161. (1997) Expression in BALB/c and C57BL/6 mice of Rt6-1 and Rt6-2 ADP-ribosyltransferases that differ in enzymatic activity: C57BL/6 Rt6-1 is a natural transferase knockout. J Immunol 159:2741–2749. (2013) P2X7 receptor inhibition increases CNTF in the subventricular zone, but not neurogenesis or neuroprotection after stroke in adult mice. Transl Stroke Res 4:533–545. (2009) Crystal structure of the ATP-gated P2X(4) ion channel in the closed state. Nature 460:592–598. (2003) Deletion of the P2X7 nucleotide receptor reveals its regulatory roles in bone formation and resorption. Mol Endocrinol 17:1356–1367. (1979) A new class of ATP antagonist. Proc Aust Physiol Pharmacol Soc 10:156P. (2013) TLR-independent and P2X7-dependent signaling mediate Alu RNA-induced NLRP3 inflammasome activation in geographic atrophy. Invest Ophthalmol Vis Sci 54:7395–7401. (2012) Clinical evaluation of the efficacy of the P2X7 purinergic receptor antagonist AZD9056 on the signs and symptoms of rheumatoid arthritis in patients with active disease despite treatment with methotrexate or sulphasalazine. Ann Rheum Dis 71:1630–1635. (2013) Dual gating mechanism and function of P2X7 receptor channels. Biophys J 104:2612–2621. (2011) The P2X7 receptor-pannexin-1 complex decreases muscarinic acetylcholine receptor-mediated seizure susceptibility in mice. J Clin Invest 121:2037–2047. (2011) P2X7 receptor activation ameliorates CA3 neuronal damage via a tumor necrosis factor-α-mediated pathway in the rat hippocampus following status epilepticus. J Neuroinflammation 8:62. (2013) Differential nuclear factor-kappa B phosphorylation induced by lipopolysaccharide in the hippocampus of P2X7 receptor knockout mouse. Neurol Res 35:369–381. (2010) P2X7 receptor regulates leukocyte infiltrations in rat frontoparietal cortex following status epilepticus. J Neuroinflammation 7:65. (1999) A new monoclonal antibody detects a developmentally regulated mouse ecto-ADP-ribosyltransferase on T cells: subset distribution, inbred strain variation, and modulation upon T cell activation. J Immunol 163:6014–6022. (2007) Single domain antibodies from llama effectively and specifically block T cell ecto-ADP-ribosyltransferase ART2.2 in vivo. FASEB J 21:3490–3498. (2013) Electrophysiological studies of upregulated P2X7 receptors in rat superior cervical ganglia after myocardial ischemic injury. Neurochem Int 63:230–237. (2004) Extracellular nucleotides act through P2X7 receptors to activate NF-kappaB in osteoclasts. J Bone Miner Res 19:642–651. (2012) Extracellular ATP mediates mast cell-dependent intestinal inflammation through P2X7 purinoceptors. Nat Commun 3:1034. (2002) Absence of the P2X7 receptor alters leukocyte function and attenuates an inflammatory response. J Immunol 168:6436–6445. Laeremans T, Stortelers C, Nolte F, Gonzalez M, Assuncao J, and Van Rompaey P(2010) inventors, Ablynx, assignee. Genetic immunization for producing immunoglobulins against cell-associated antigens such as P2X7, CXCR7 or CXCR4, Ablynx N.V. Patent WO2010070145. 2010 Dec 2. (1992) PPADS, a novel functionally selective antagonist of P2 purinoceptor-mediated responses. Eur J Pharmacol 217:217–219. (2010) Oxidized ATP inhibits T-cell-mediated autoimmunity. Eur J Immunol 40:2401–2408. (2003) Role of P2X7 receptors in ischemic and excitotoxic brain injury in vivo. J Cereb Blood Flow Metab 23:381–384. (2004) The Pro-451 to Leu polymorphism within the C-terminal tail of P2X7 receptor impairs cell death but not phospholipase D activation in murine thymocytes. J Biol Chem 279:16918–16926. (2008a) Synthesis and structure-activity relationship studies of tyrosine-based antagonists at the human P2X7 receptor. Bioorg Med Chem Lett 18:571–575. (2008b) Regulation of AQP4 protein expression in rat brain astrocytes: role of P2X7 receptor activation. Brain Res 1195:1–11. (2003) Purinergic P2X7 receptor function in lung alveolar macrophages: Pharmacologic characterization and bidirectional regulation by Th1 and Th2 cytokines. Drug Dev Res 59:118–127. (2009) Cell signaling via the P2X(7) nucleotide receptor: linkage to ROS production, gene transcription, and receptor trafficking. Purinergic Signal 5:175–187. (2011) Transcriptional control mechanisms associated with the nucleotide receptor P2X7, a critical regulator of immunologic, osteogenic, and neurologic functions. Immunol Res 50:22–38. (2013) Epistasis with HLA DR3 implicates the P2X7 receptor in the pathogenesis of primary Sjögren’s syndrome. Arthritis Res Ther 15:R71. (2013) Synthesis and pharmacological characterization of two novel, brain penetrating P2X7 antagonists. ACS Med Chem Lett 4:419–422. (2002) Response heterogeneity of human macrophages to ATP is associated with P2X7 receptor expression but not to polymorphisms in the P2RX7 promoter. FEBS Lett 531:127–131. (2008) Gating the pore of P2X receptor channels. Nat Neurosci 11:883–887. (2013) Subtype-specific control of P2X receptor channel signaling by ATP and Mg2+. Proc Natl Acad Sci USA 110:E3455–E3463. (2006) NAD+-induced vasotoxicity in the pericyte-containing microvasculature of the rat retina: effect of diabetes. Invest Ophthalmol Vis Sci 47:5032–5038. (2012) Extracellular ATP induces CD44 shedding from macrophage-like P388D1 cells via the P2X7 receptor. Hematol Oncol 30:70–75. (2013) Sensory-sympathetic coupling in superior cervical ganglia after myocardial ischemic injury facilitates sympathoexcitatory action via P2X7 receptor. Purinergic Signal 9:463–479. (2010) Inhibition of ATP-induced macrophage death by emodin via antagonizing P2X7 receptor. Eur J Pharmacol 640:15–19. (2008) Identification of key residues coordinating functional inhibition of P2X7 receptors by zinc and copper. Mol Pharmacol 73:252–259. (2010) P2X(7) receptor-mediated release of cathepsins from macrophages is a cytokine-independent mechanism potentially involved in joint diseases. J Immunol 185:2611–2619. (2012) P2X7 signaling promotes microsphere embolism-triggered microglia activation by maintaining elevation of Fas ligand. J Neuroinflammation 9:172. (2006) P2RX7, a gene coding for a purinergic ligand-gated ion channel, is associated with major depressive disorder. Hum Mol Genet 15:2438–2445. (2011) P2X7 receptor signaling in the pathogenesis of smoke-induced lung inflammation and emphysema. Am J Respir Cell Mol Biol 44:423–429. (1994) Reversible ADP-ribosylation as a mechanism of enzyme regulation in procaryotes. Mol Cell Biochem 138:123–129. (2010) On the role of P2X(7) receptors in dopamine nerve cell degeneration in a rat model of Parkinson’s disease: studies with the P2X(7) receptor antagonist A-438079. J Neural Transm 117:681–687. (2012) A reassessment of P2X7 receptor inhibition as a neuroprotective strategy in rat models of contusion injury. Exp Neurol 233:687–692. (2008) P2X7 pre-synaptic receptors in adult rat cerebrocortical nerve terminals: a role in ATP-induced glutamate release. J Neurochem 105:2330–2342.